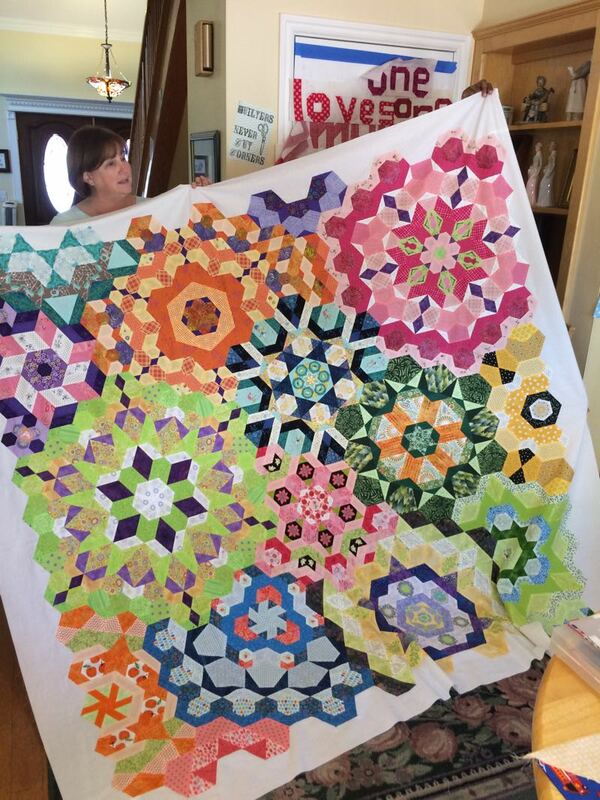 Good Heart Quilters | OccasionalPiece--Quilt! 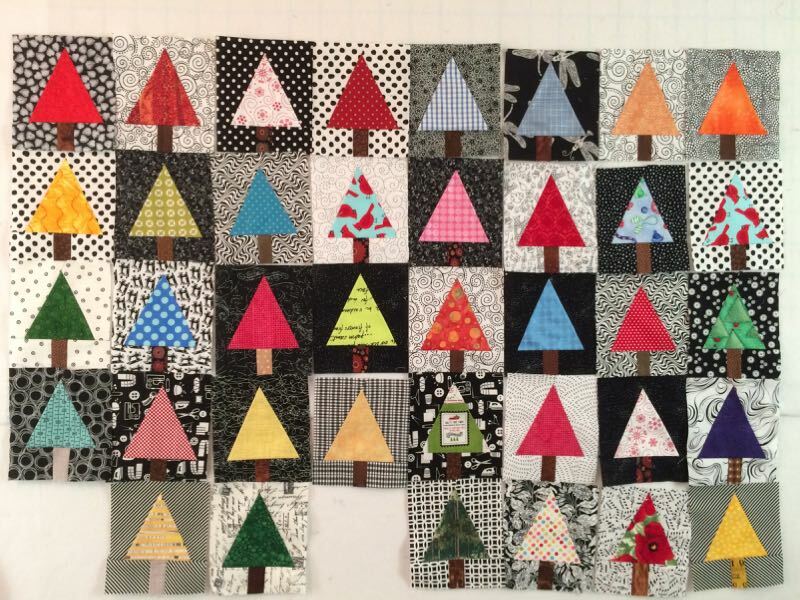 Posted on December 2, 2016 by Elizabeth E.
This picture-filled post shows when a bunch of the local Good Heart Quilters (my little quilting group) got together to trade Christmas Tree blocks (pattern found on *this* post). 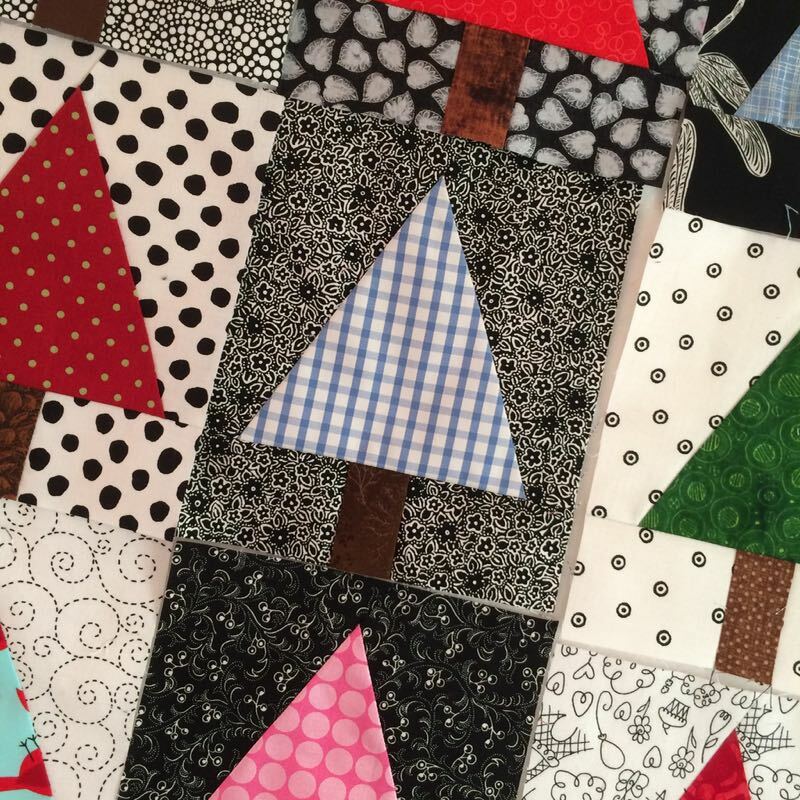 Usually we don’t meet in December, but then Leisa had this idea about these Christmas Tree blocks. 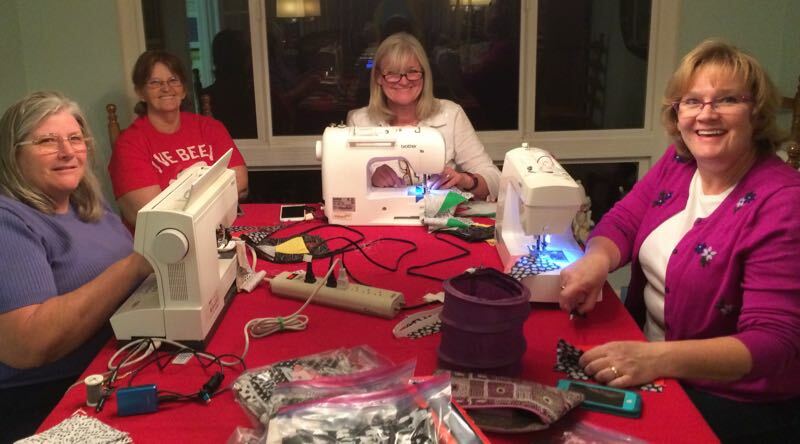 Those who were interested in the swap came together in a Flash Mob Quilt Night; we had a great time, although family trips and sickness prevented some from coming. We’re nothing if not helpful. 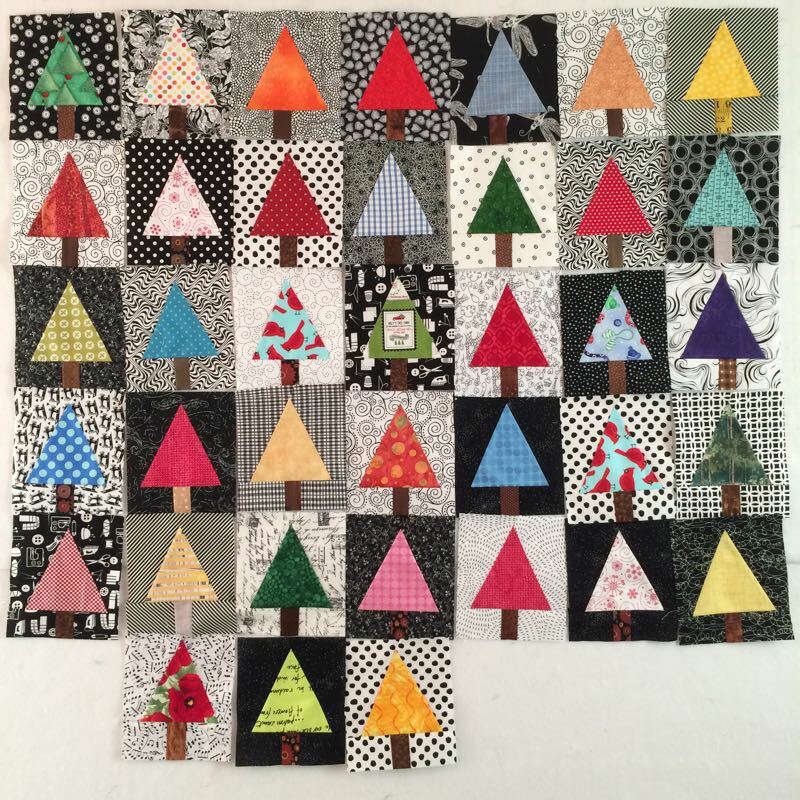 Some of us had our trees already made, so we all pitched in a sewed, ironed and trimmed the others’ blocks so we all went away with our set. We dealt out all the blocks. I asked everyone to count their blocks (below), for after an evening of letting loose with children-and-husband-and-life stories, lots of laughing, too many delicious cookies, I couldn’t be depended on to get the numbers right. 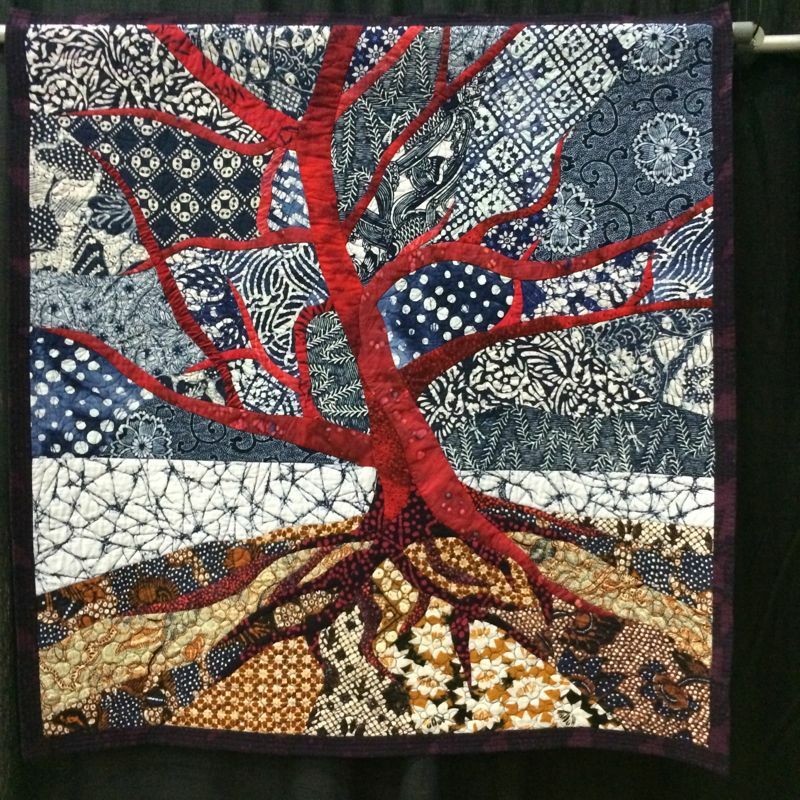 This is one of mine, made afterwards, with a bit of my husband’s blue-and-white plaid shirt. 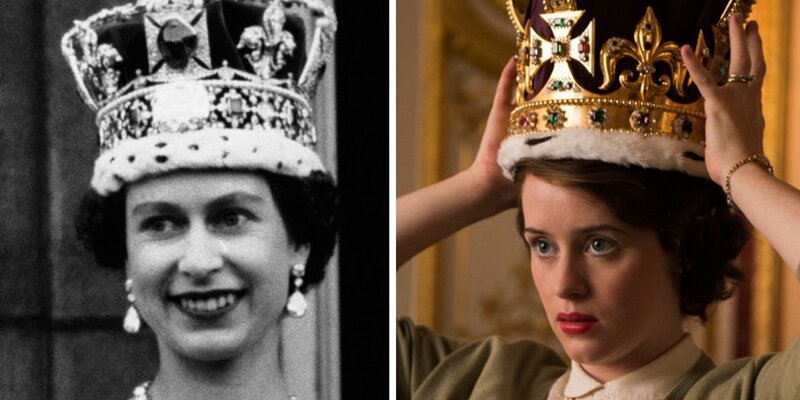 The Crown, streaming off of Netflix, fictionalizing Queen Elizabeth as a young woman. 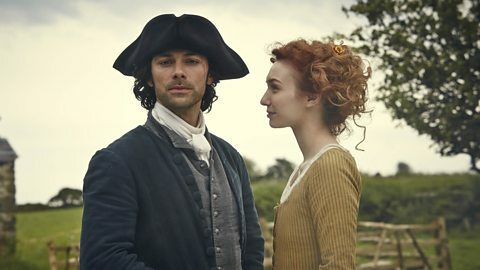 Poldark, on PBS (we watched the first season via CDs from Netflix). And apparently Endeavor, a crowd-pleaser in our house, will return for a fourth season. 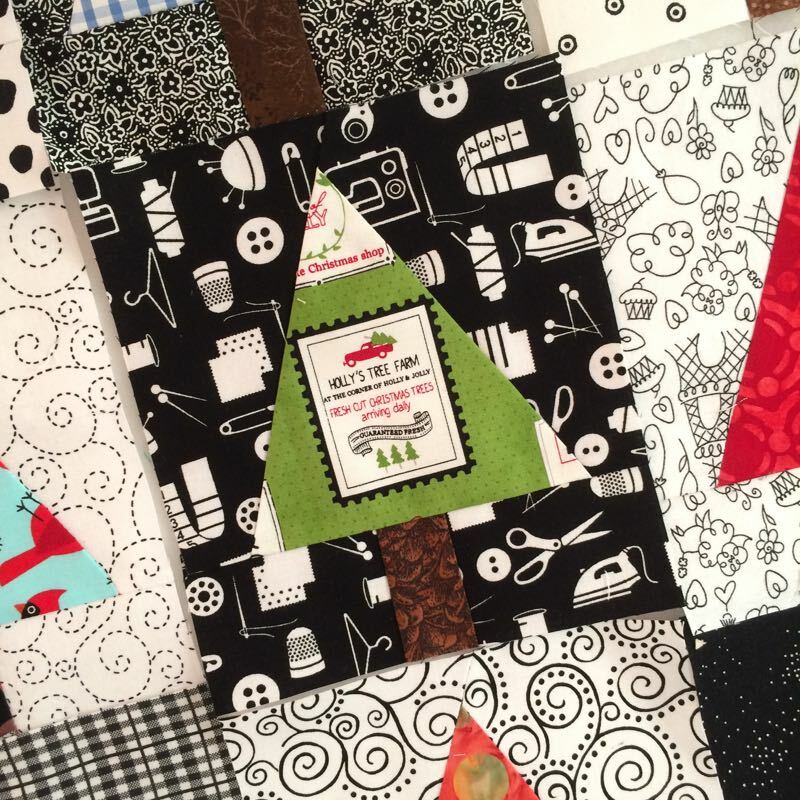 Oh, and then there’s that big event called Christmas, which needs some time…Happy Quilting! 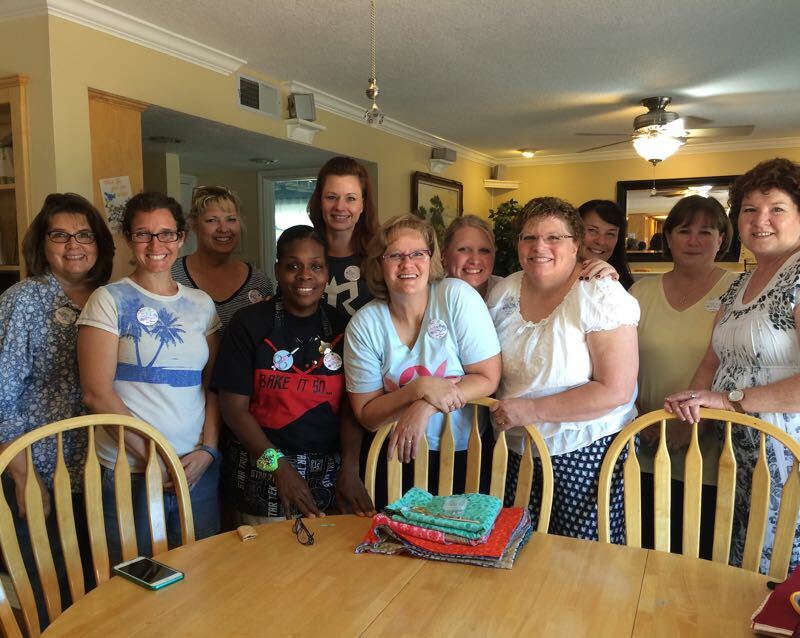 Posted on July 16, 2016 by Elizabeth E.
The 5th Annual Good Heart Quilters Retreat began last Friday morning (7/8/16). 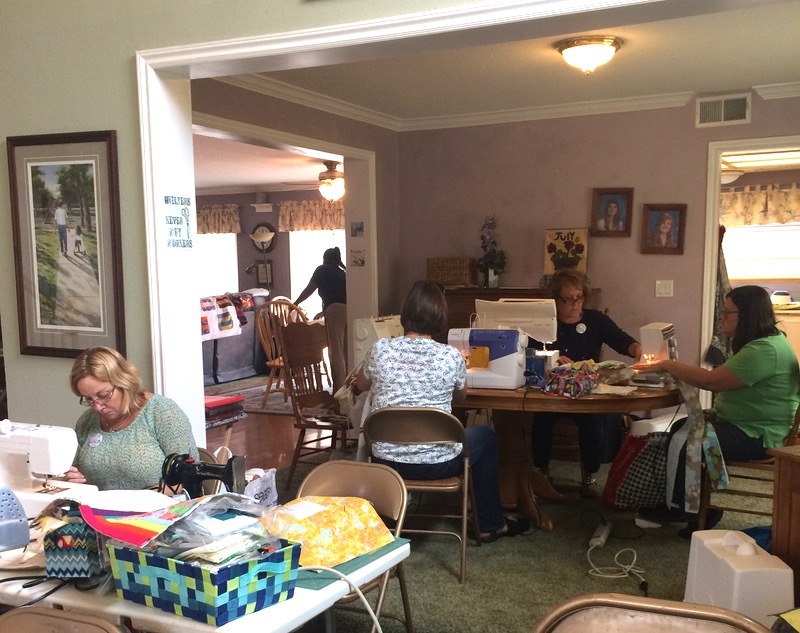 For those of you who don’t know yet about this small quilting group I participate in, The Good Heart Quilters began meeting about 20 years ago, and have been meeting about once a month, taking summers off. 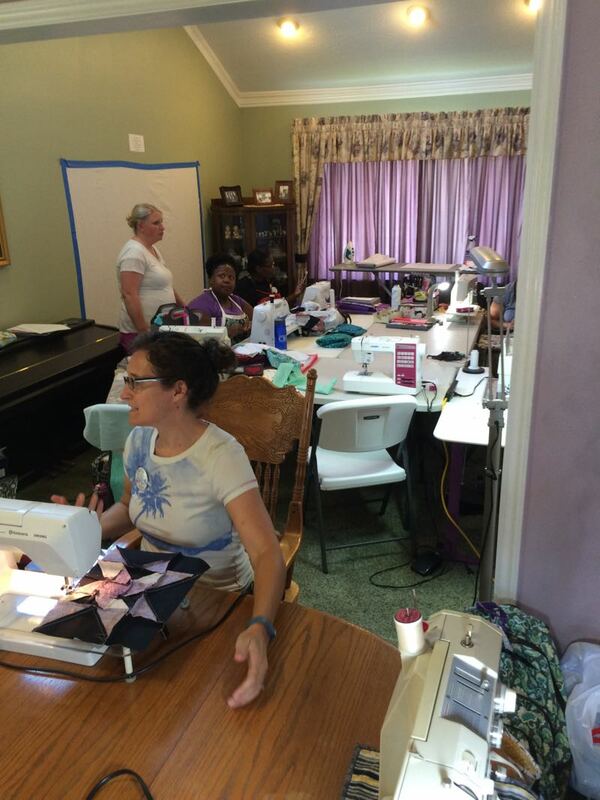 Five years ago, Lisa decided she wanted to do a retreat, so she clears out all the furniture, brings in tables and chairs and we come and sew (or mostly sing and talk, it seems like) for two days in July. She also invites her relatives to join us, so they all schlep down from Utah/Washington, which is really fun. Above is Elly, our newest member. In the background are Nycole and Brittany. I always believe I will get something done, which is a complete fantasy. 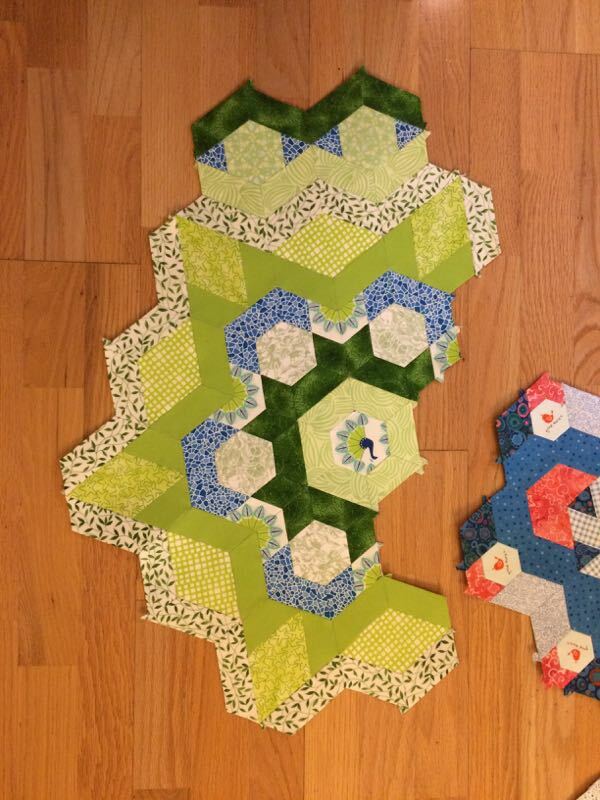 On Friday, I made four log cabin bee blocks, all the wrong size, and put this Chuck Nohara square together, then had to rip it apart when it didn’t fit. 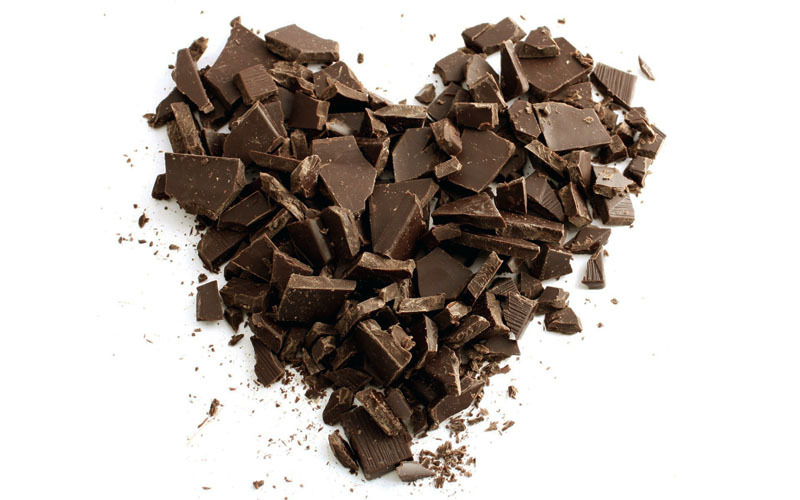 I did make it over to Costco at dinner time and brought back an “All-American Chocolate Cake” (aka, “Death by Chocolate”) so the day wasn’t a total loss. Lori just puts her head down and goes. This is the culmination of her LQS Sampler Saturdays. 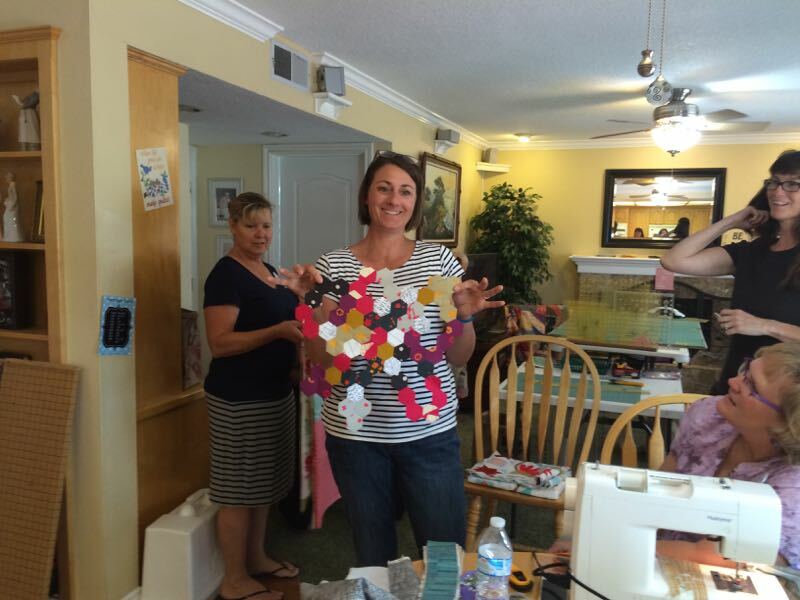 Jean is another who quilts and quilts and gets her blocks sewn together at retreat. She’s amazing. Coming back from dinner. I think we had about 12 sewers on machines, and one doing handwork. We had two more join us on Saturday, which is when I pulled out all my words from the Spelling Bee I’m in, and tried to make some to fill in where I didn’t have. Again, a total illusion that I’ll actually get something done. We do Show and Tell at Saturday lunch. This is Brittany’s. 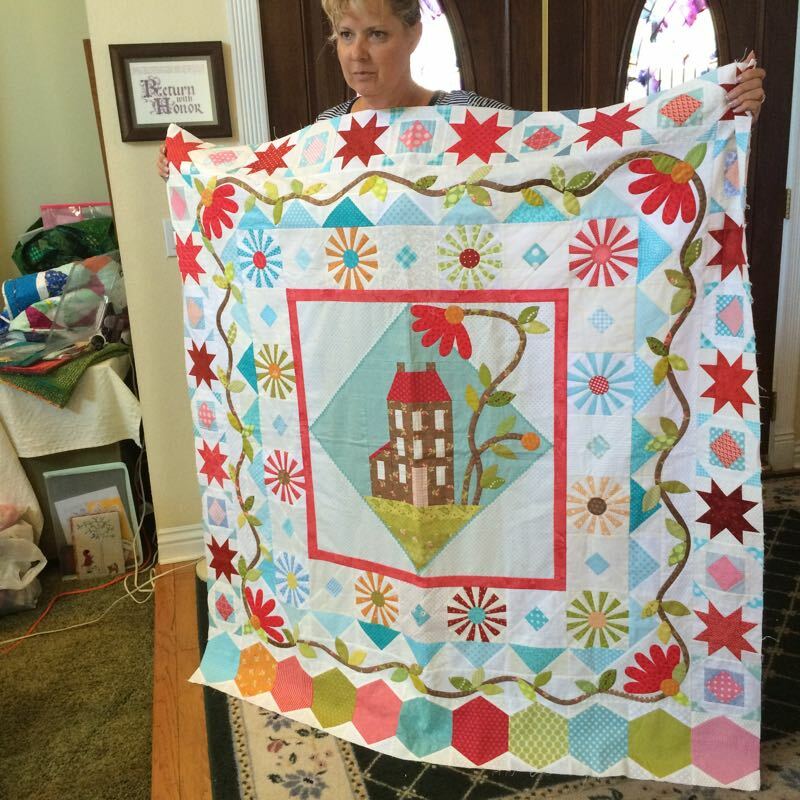 Charlotte did a quilt with Monopoly Fabrics. 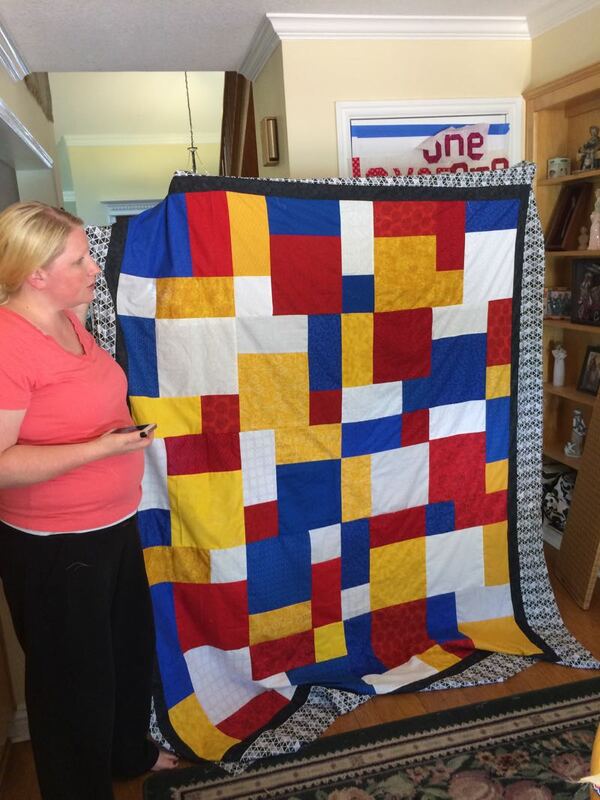 Nycole made a quilt in her husband’s favorite soccer team’s colors, and played us the RSL song that is sung at the games. 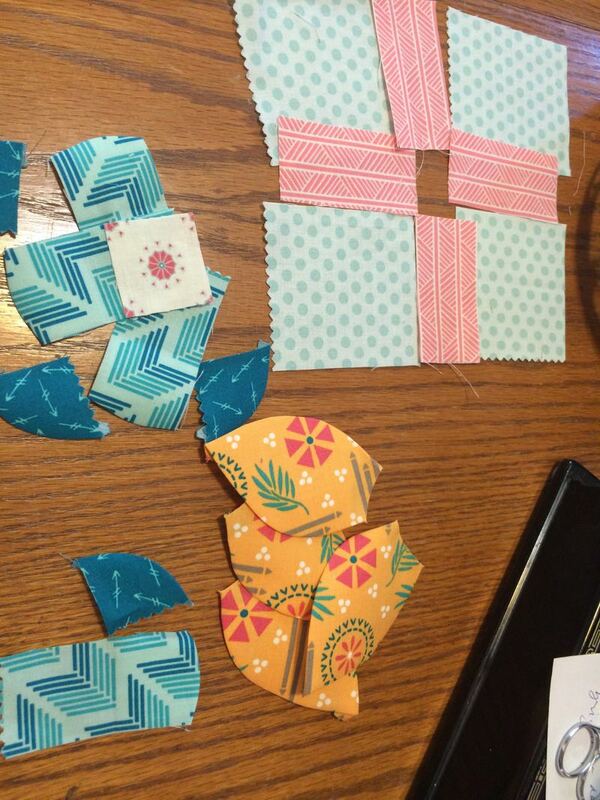 Simone’s been working on a baby quilt: free-form hexies will be appliquéd to a very creative front. And YES! I finished something: Simone’s word for this month’s Spelling Bee. She’s playing with all our minds and asking us to make the names of colors in a color other than is indicated. 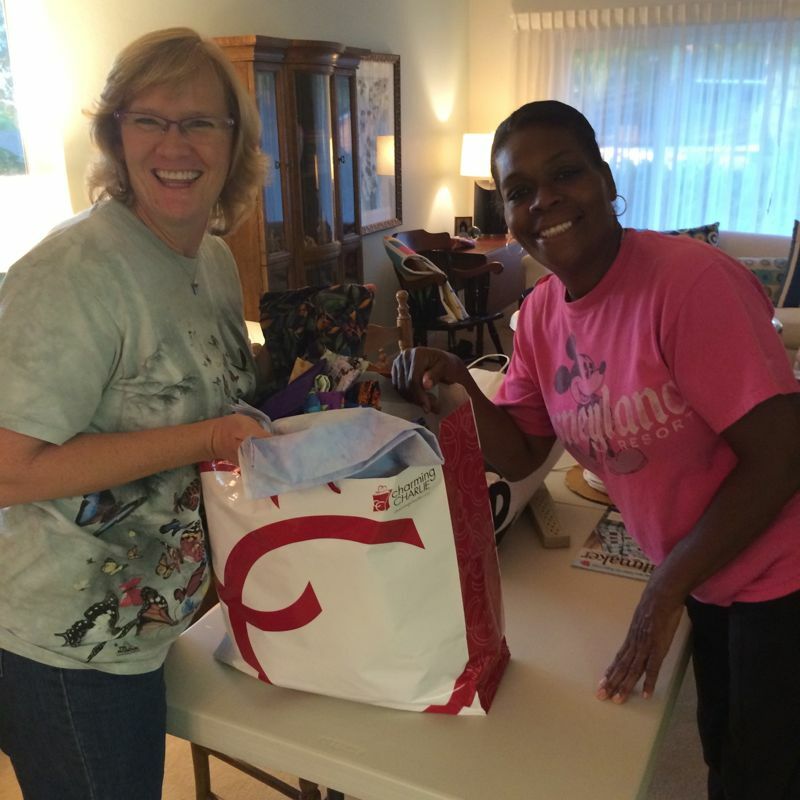 Lisa sent us home with lots of goodies, all in a Daiso Japan zipper case — thank you, Lisa!! 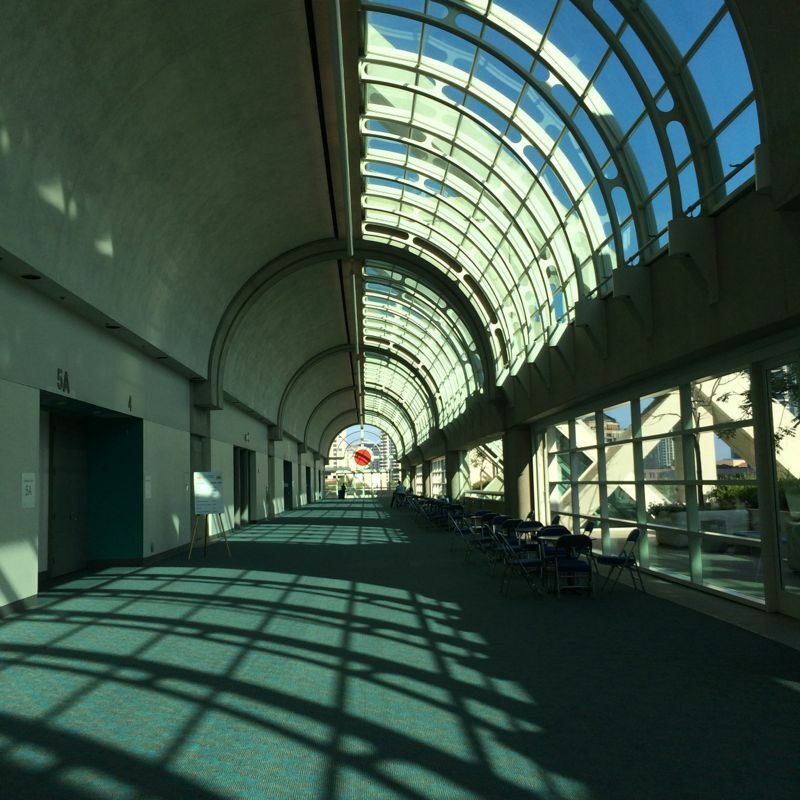 See you all next year! 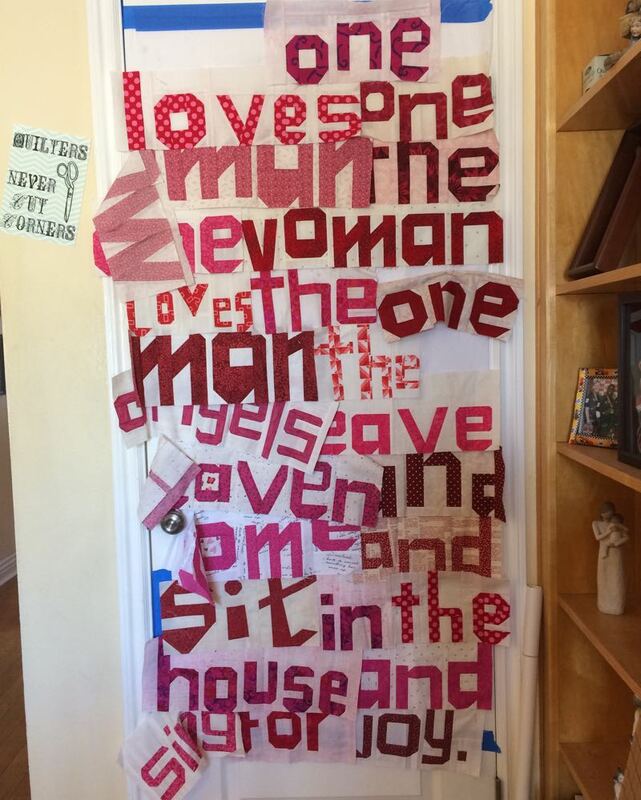 Posted on March 5, 2016 by Elizabeth E.
Janice, who wrote: “WOW! 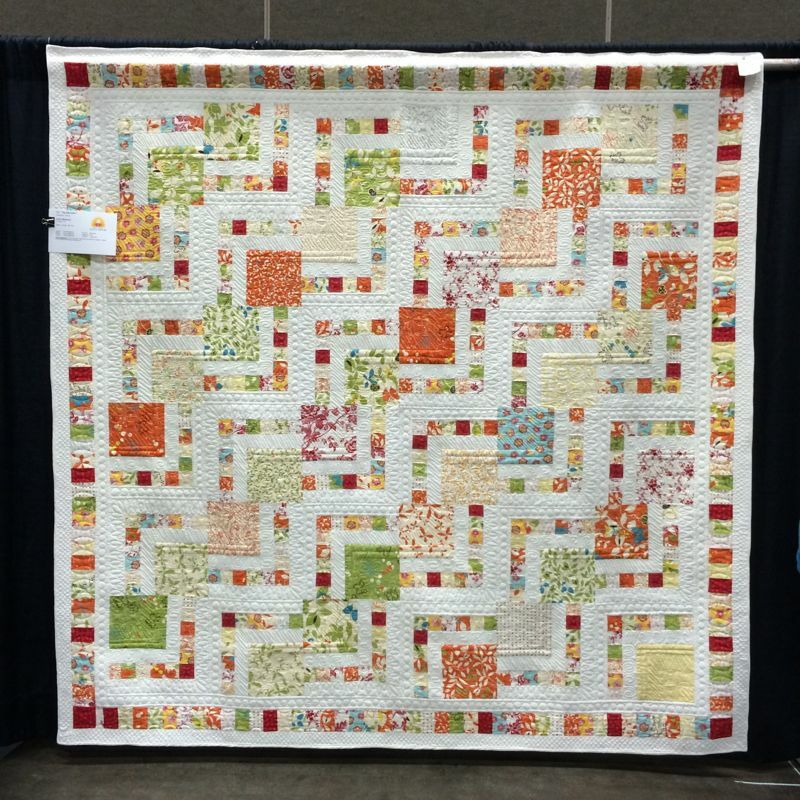 I just began following your blog and missed the start up of this QAL. 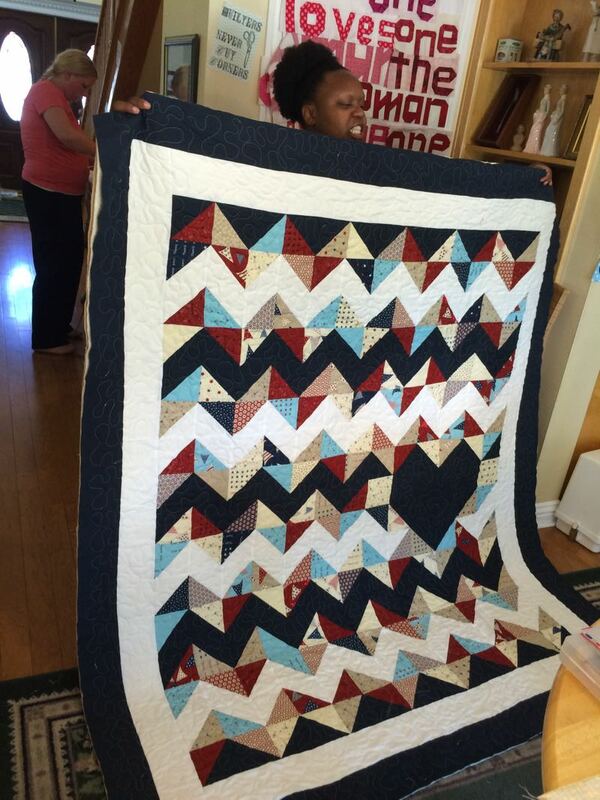 After seeing your beautiful work, I am inspired to dive in and QAL too. I love the embroidery details. . . [and the] layering [of] the stitches. I’d choose the magazine. Thanks for the great give away. I can’t wait to see your finished tree.” I’ll send you the magazine. Good luck on the Oh Christmas Tree project to these two and to all of you (and me). I tried out making birds last night and they went so fast, as there’s far less stitching work on them. Can’t wait until next month to tell you about this. 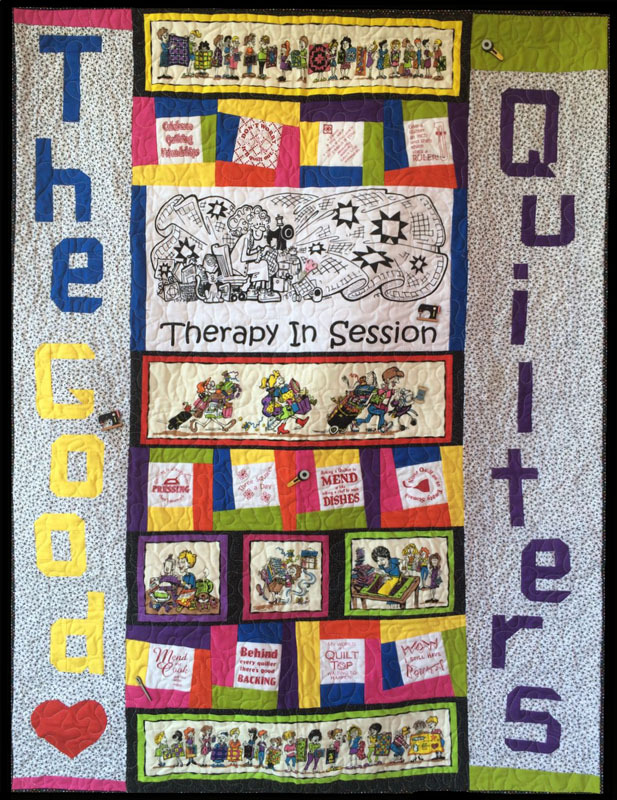 In my regular, non-digital life, I attended our monthly gathering of the Good Heart Quilters, a group of friends who have been quilting together off-and-on (with new members coming in, and old members leaving) for the better part of twenty years. 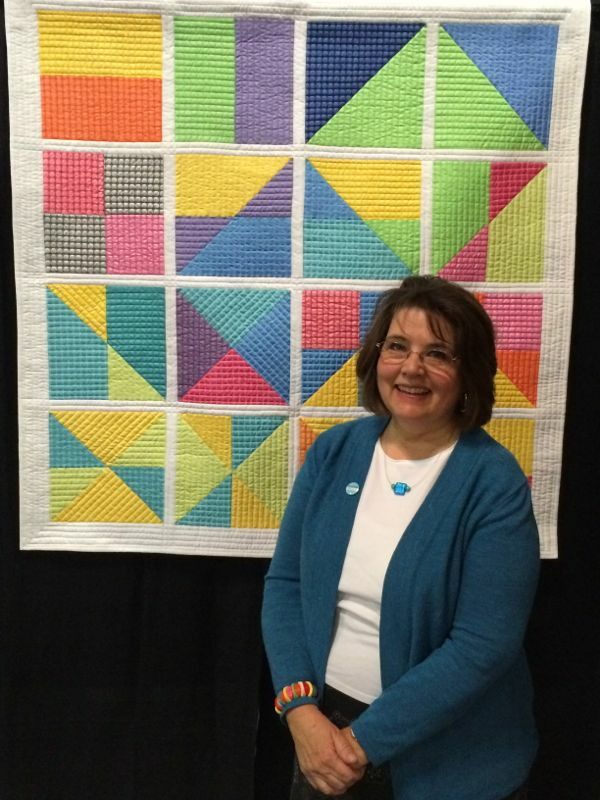 Charlotte, a newer member showed off what I think is only her third quilt top EVER, a Monopoly board. All the fabrics are Monopoly fabrics. Terrific! 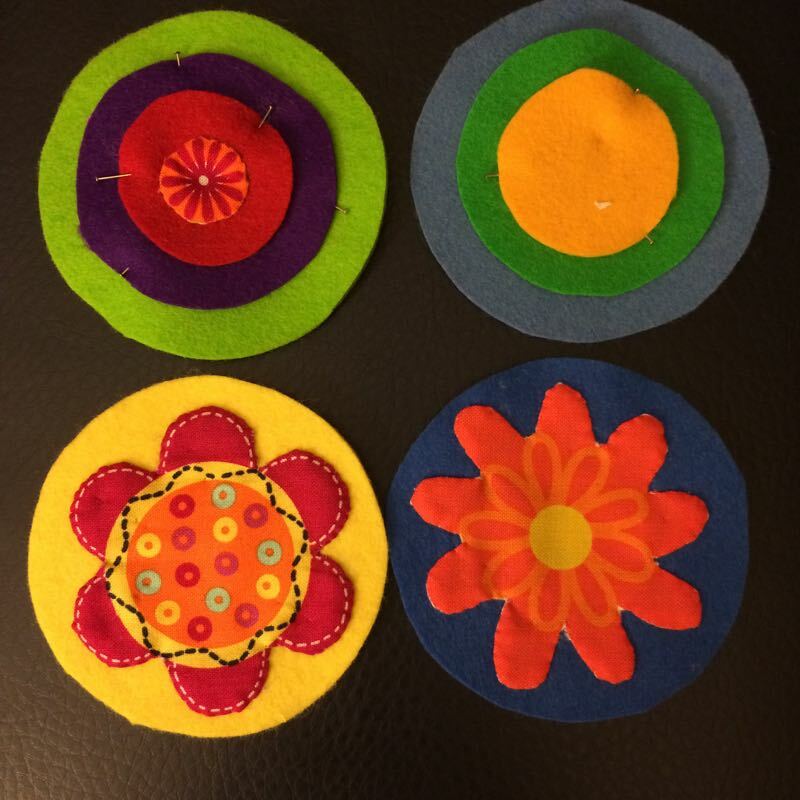 Laurel brought two new rosettes for the New Millefiore Hexagon and re-arranged them to make more sense. She has an exquisite sense of color. Caitlin, whose house it was at, had a nice spread of snacks, including freshly baked brownies, and she worked on Christmas stockings. 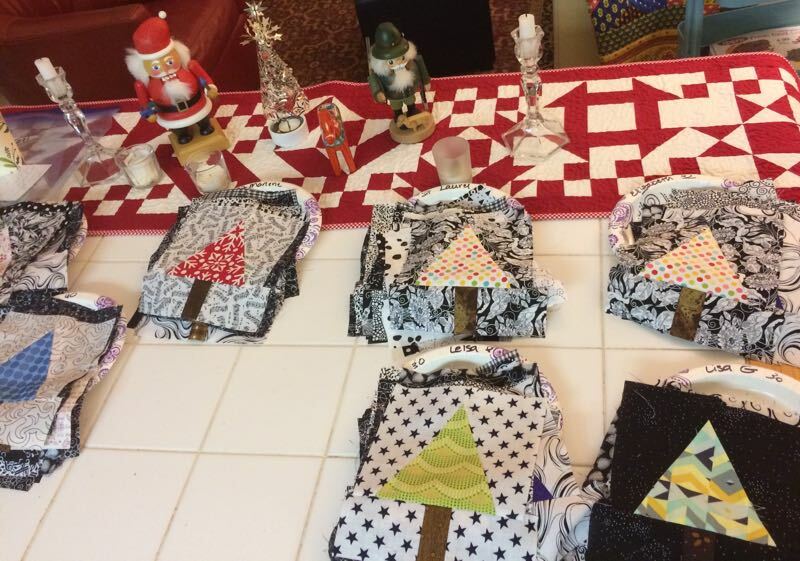 Lisa and I did hand work–Lisa sewed together hexies and I worked on Step 3 of the Oh Christmas Tree QAL, which I already mentioned. 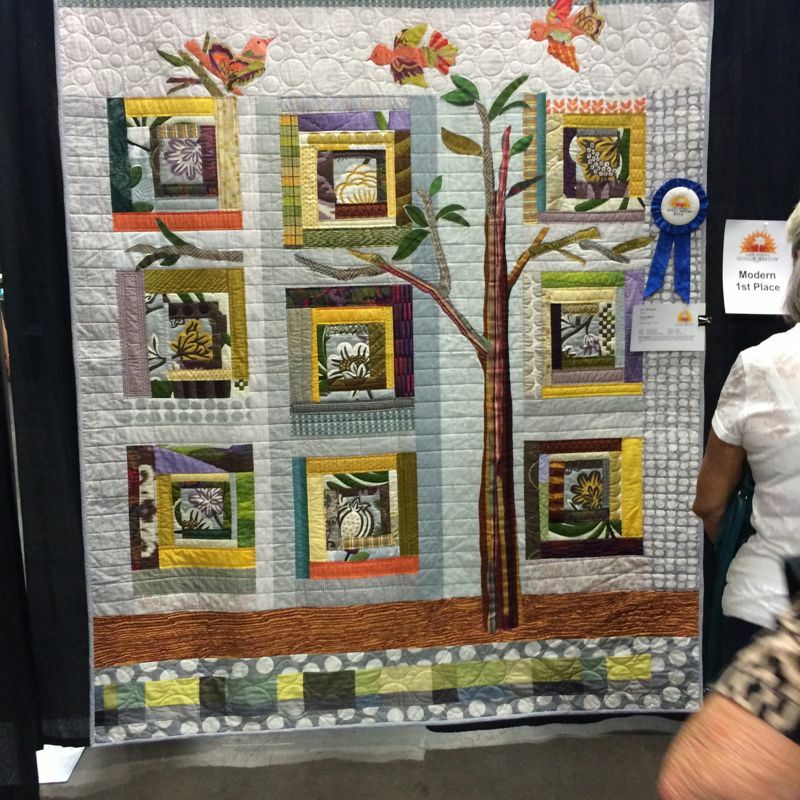 We had a lively and interesting conversation, running from mid-century modern furniture to QuiltCon to Donald Trump. I wanted to show everyone my newest flowers. There they are above, all prepped up, with fabric appliqued on three of them. And below, you can see my progress. I sewed the backstitch around the orange fabric not only so you’ll think I’m so clever, but also to cover up some wonky appliqué. Okay, that’s the real reason. 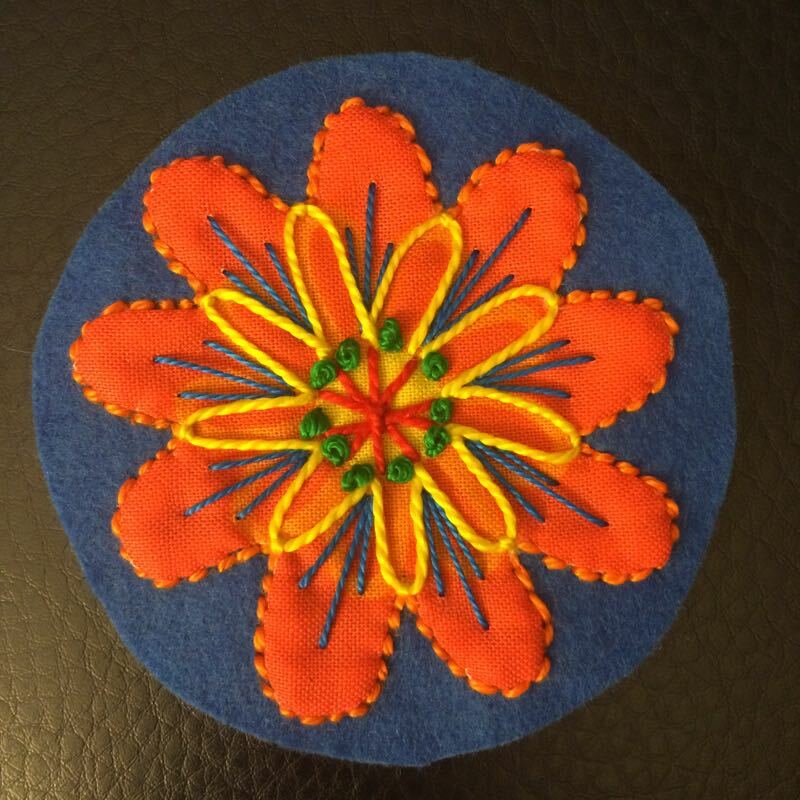 Then I just got going on it, and kept adding stitching. 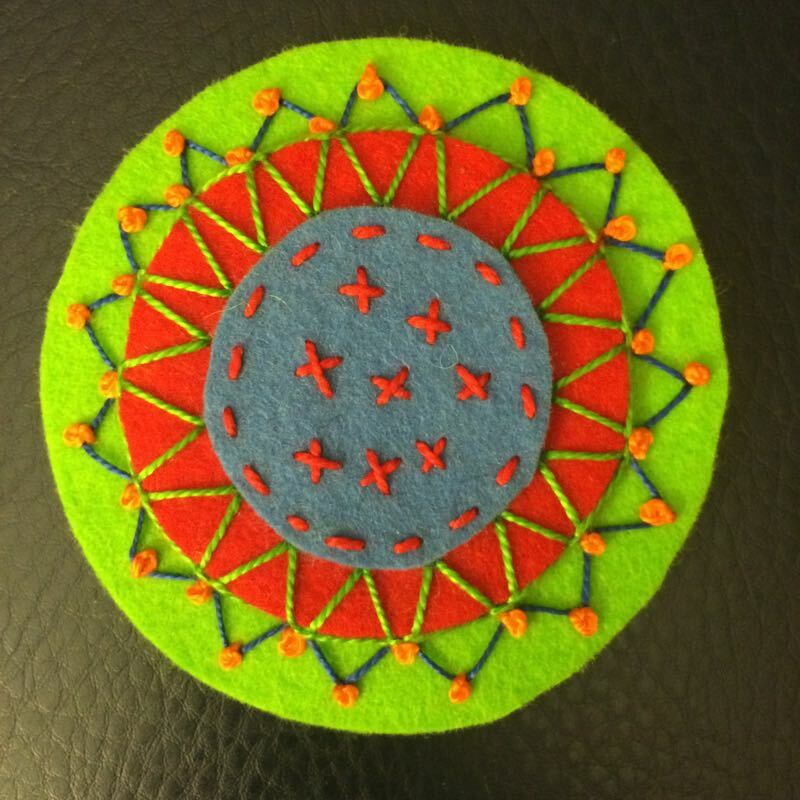 On this one, I borrowed one of Wendy’s ideas for the center, then did “closed blanket stitch” for the green-on-red ring and then just a zig-zag backstitch with small French knots (3 wraps of the needle using size #12 pearl cotton) at each juncture. It’s really a layering sort of task. I add this stitch, and ask. . . now what? It also helped that the program I was watching, “Sagrada,” a documentary on La Sagrada Familia cathedral in Barcelona, Spain was still going on. We’re headed there this year and I can hardly wait to see all of Gaudi’s surface decoration and bring home more ideas of what to put on these circles. Lastly, I finished up two sets of bee blocks, the first for Linda of the Mid-Century Moderns. She asked for tiny churn dashes; these are measure 4″ finished. We were also supposed to make some unusual section but still keep the church dash recognizable. 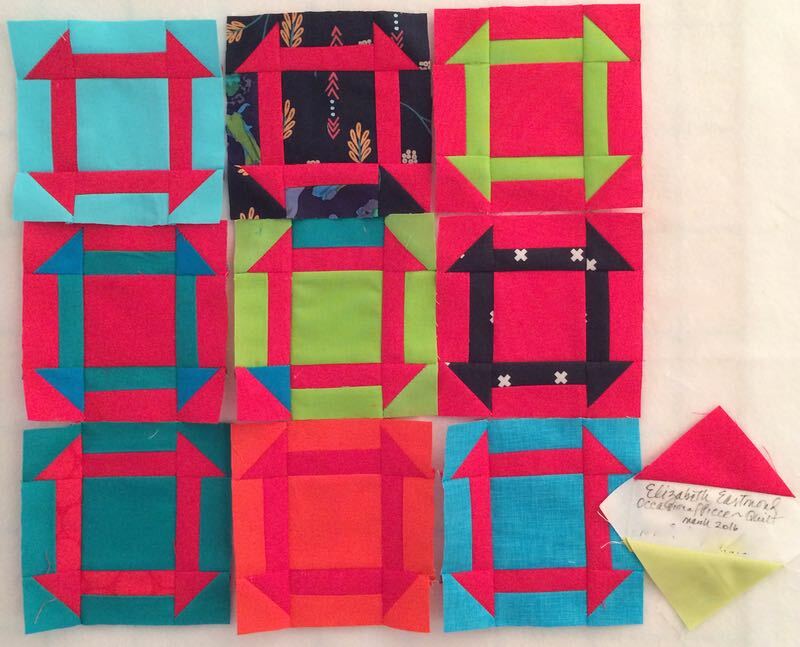 I wasn’t too inventive, switching around colors and turning corner blocks. 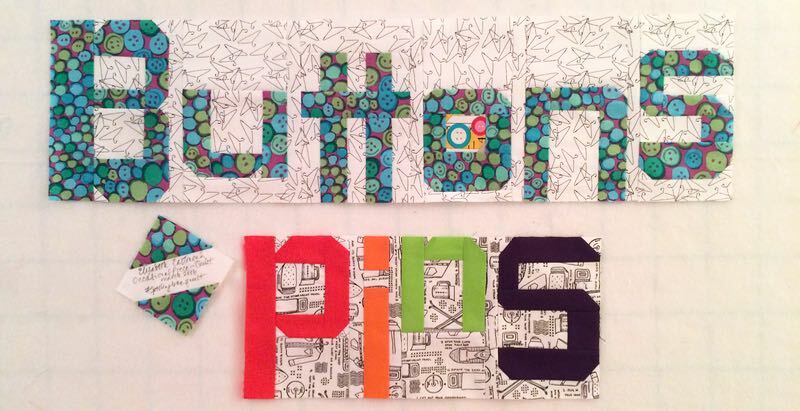 Mary of the Spelling Bee (#spellingbeequilt), an IG bee, asked for sewing words, then asked for us to add one more word. I wonder if that “i” is too long; I included extra fabric in case she wants to shorten it up. 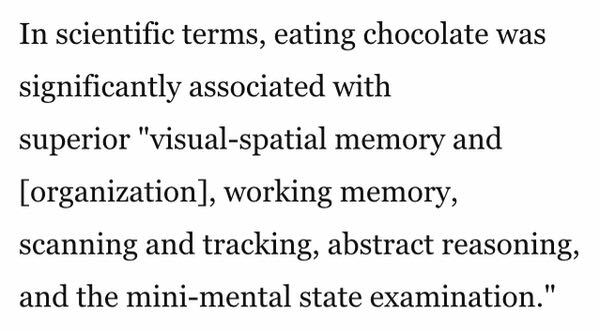 Lastly, I thought you’d be happy to have some solid research behind our quilter’s habit of eating chocolate, from an article published March 4, 2016, in the Washington Post. 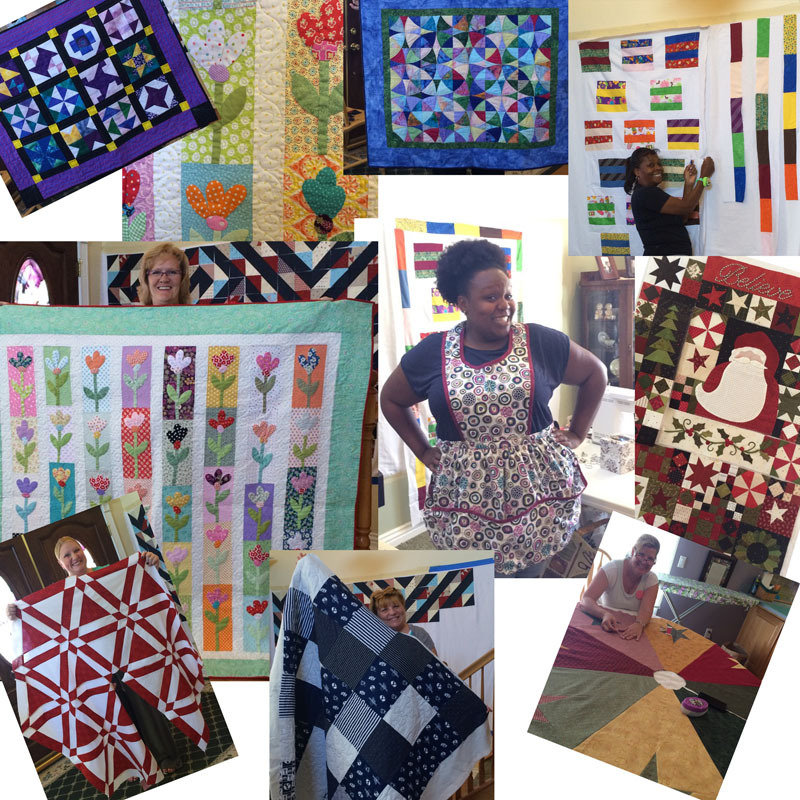 Definitely need to keep up our visual-spatial memory and organization in order to keep sewing our quilts together! 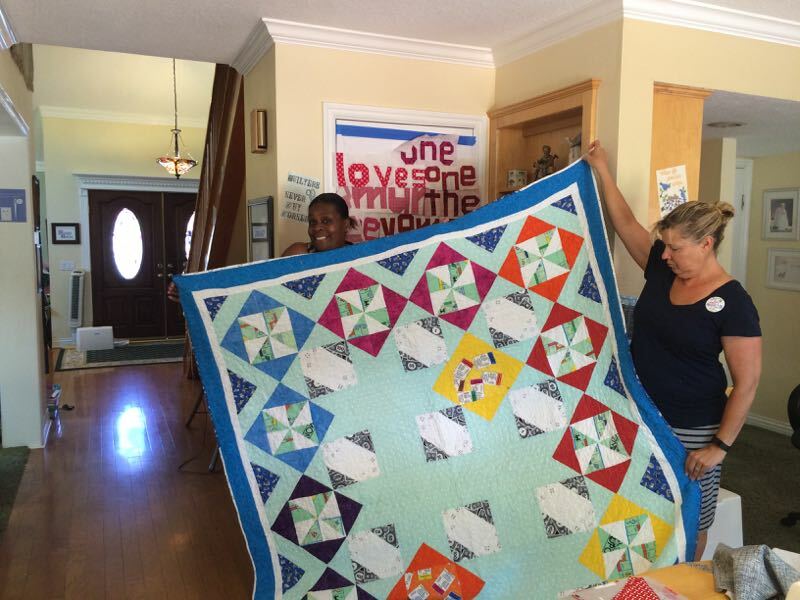 Posted on July 11, 2015 by Elizabeth E.
The Good Heart Quilters had their 4th annual quilt retreat at Lisa’s home this summer. She is the smiling blonde marathoner in the lower right (I am in the yellow T-shirt). Some of our group isn’t here, and we also had a couple of newbies join us this year. We meet at Lisa’s home Friday morning, eat lunch together (Lisa gets it all beforehand) and this year, we went out for dinner, then sew into the night. Saturday the group meets up again (we always lose a few on Saturday) and goes again until they can’t anymore. From this industry. . .
. . . came these results. We had some handwork going. 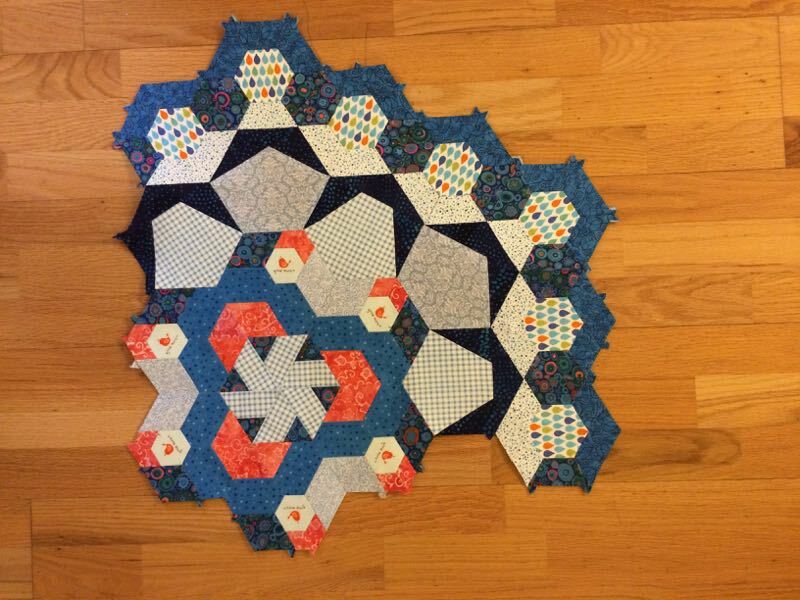 Laurel shows her Rosette #1 of the New Hexie Millefiore Quilt along, and the start of her third rosette is the inset. Lisa was more than patient with me as I auditioned centers for this house block for her to comment on. 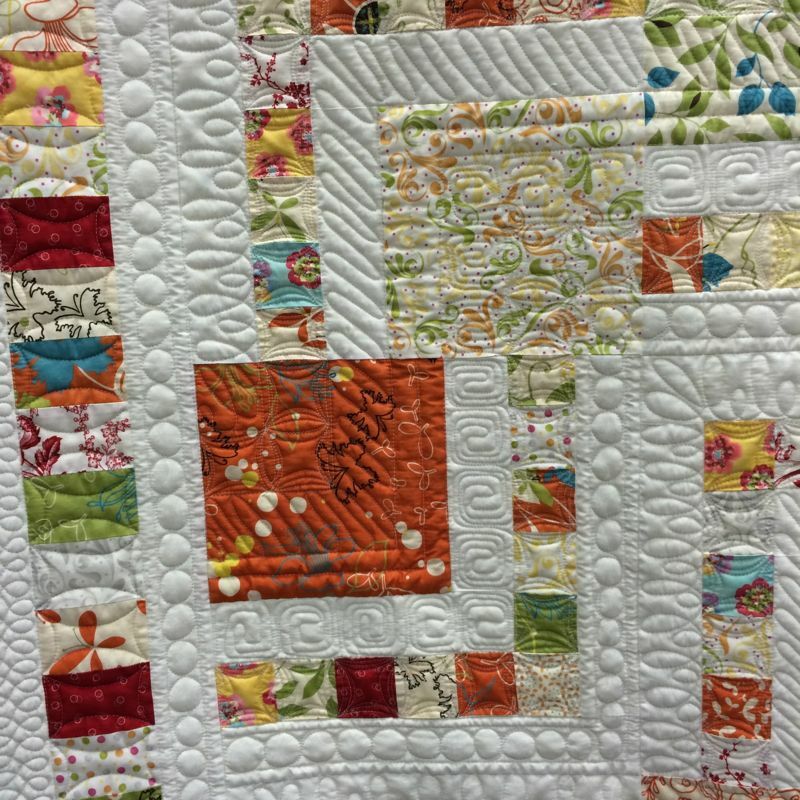 At 16″ it is to be a mini quilt for a swap I’m in. 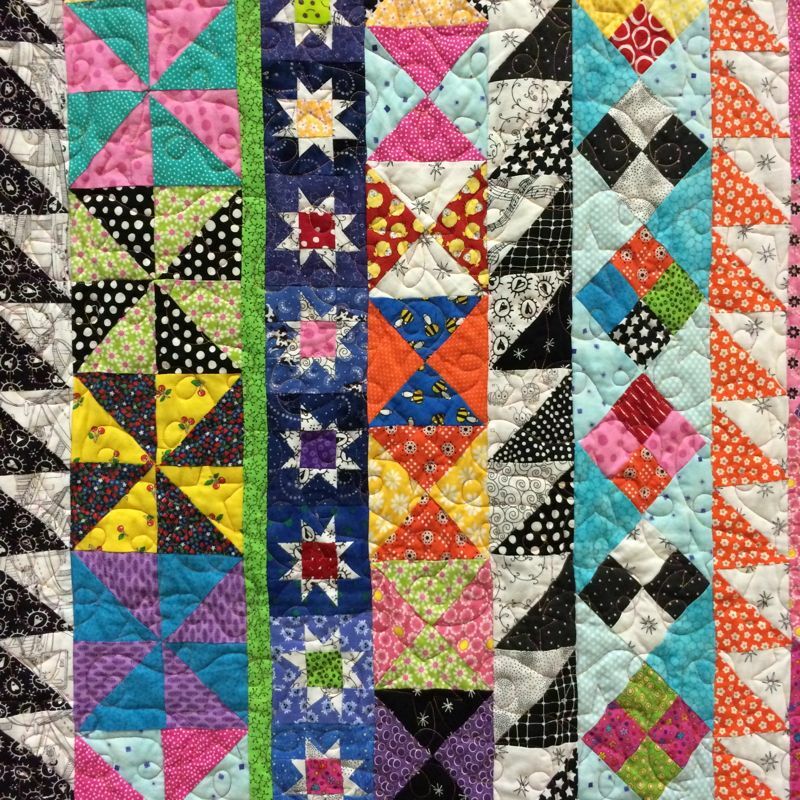 While the easy way would be to use the popular Swoon pattern, I went back to Barbara Brackman’s Encyclopedia of Quilt Patterns and went to the source: a block titled Rolling Star from 1932. This brilliant little house idea came from Blue Mountain Daisy. 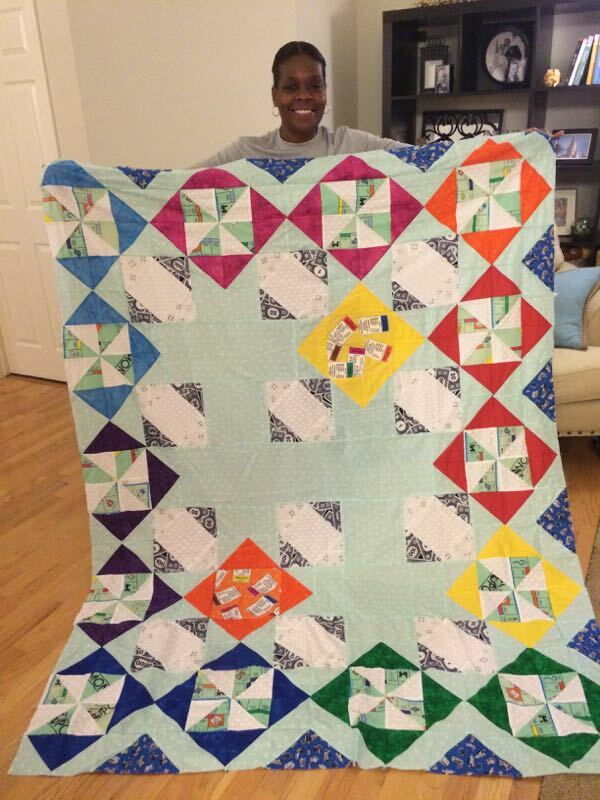 After setting in umpteen Y-seams and a billion more V-seams, I finished the mini quilt top. 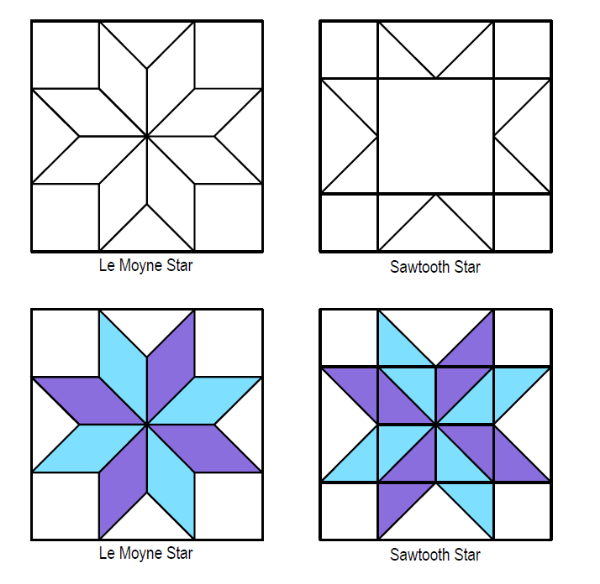 I think using the Swoon Block method of half-square triangles would have been easier, but the center of the original Rolling Stone block is also a Lemoyne Star, rather than the a Sawtooth Star block, so inset seams it is (although I suppose I could subdivide them like the lower block on the right). 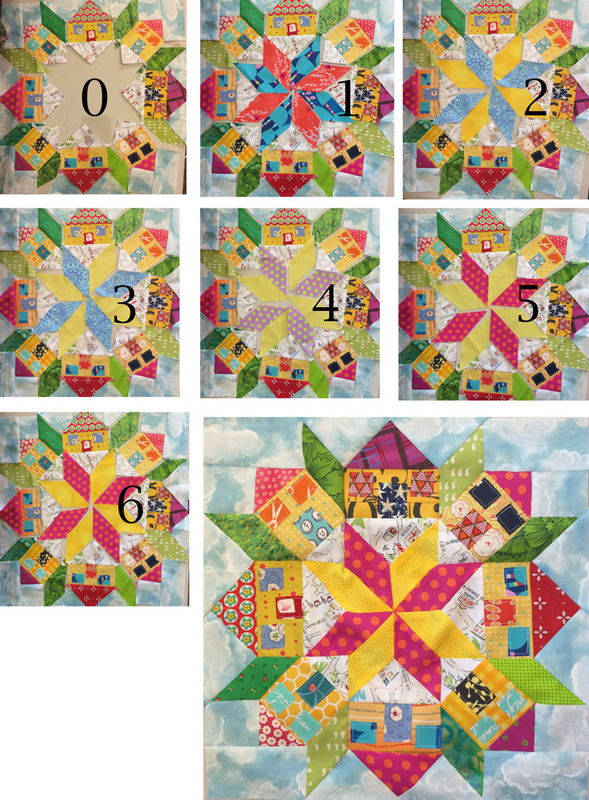 I like to try this original Rolling Star block again, now that I’ve got one under my belt. We’ll see which one ends up going to my partner! 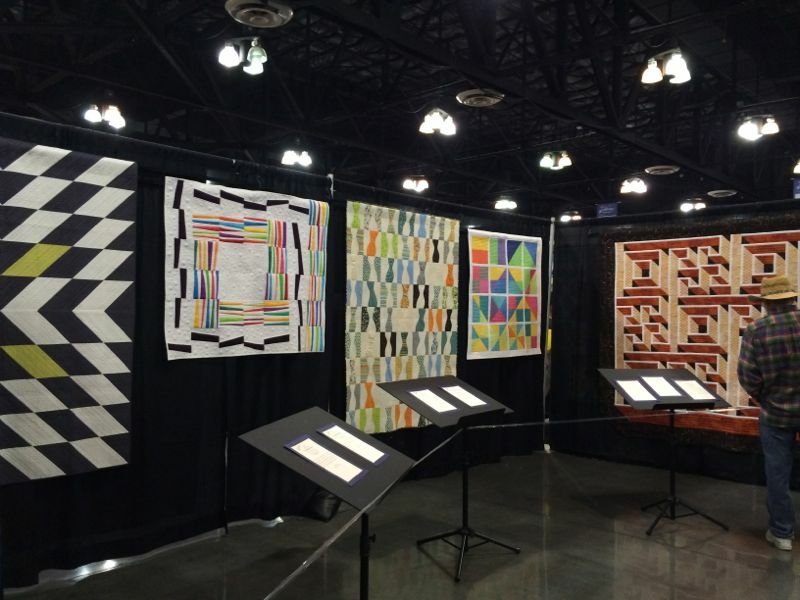 Posted on January 25, 2015 by Elizabeth E.
This was my big weekend at Road to California where I got to see three of my quilts hanging at the Road to California quilt show. I enjoyed every minute of it. Above, St. Nicholas and I are whooping it up. 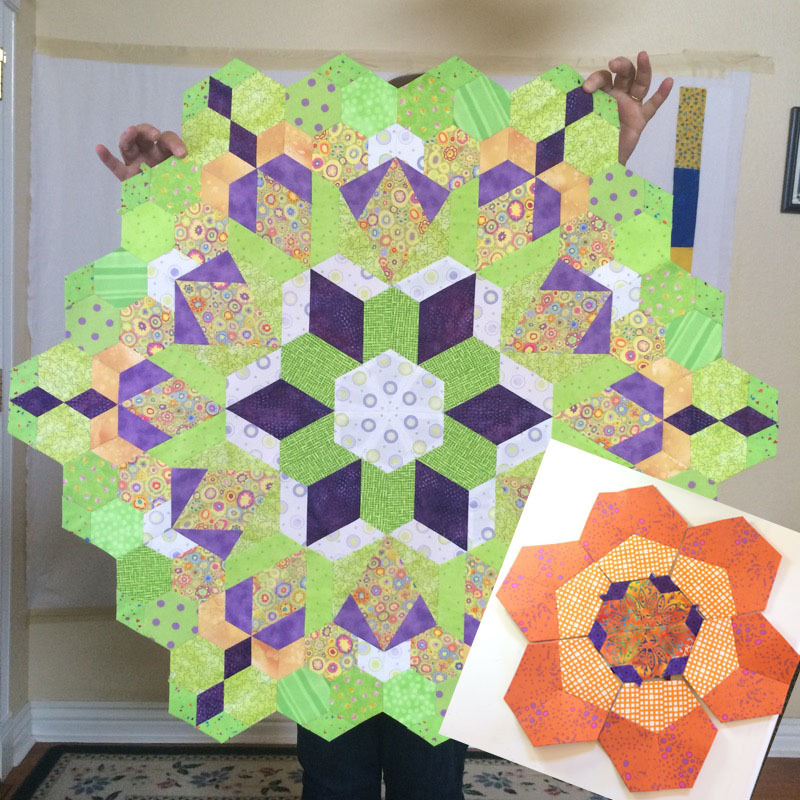 When I wasn’t there checking on him, he hung out with two other really cool Christmas quilts. Here I am with Sol Lewitt, who so graciously provided an idea for me to work with in cloth. 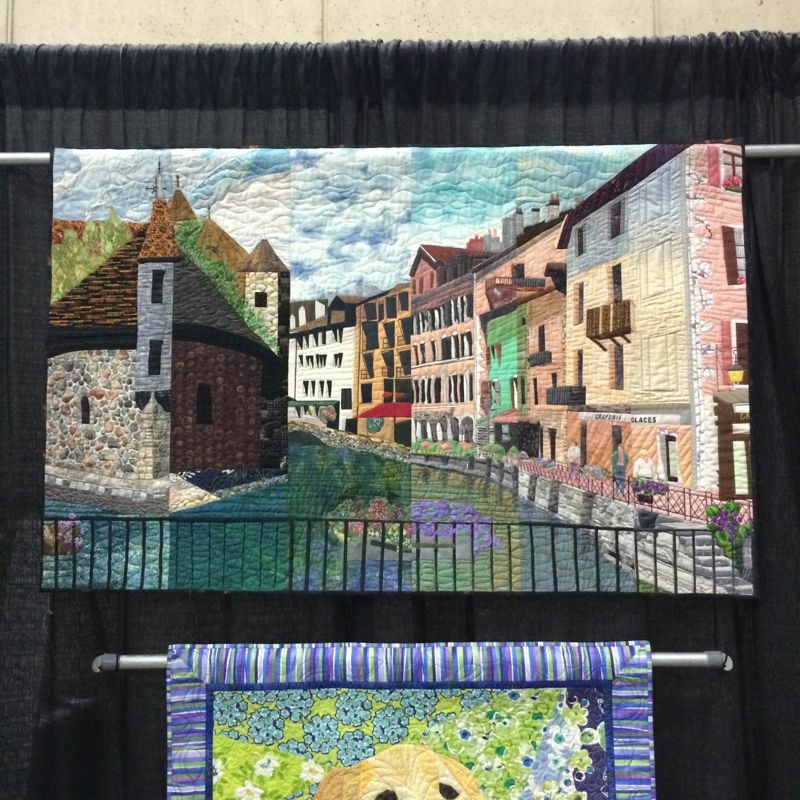 He was tucked into a corner among the Modern Quilts — a lovely home. All those Lollypop Trees were on a side aisle, which was consistently busy. I had many nice conversations with people who stopped by when I was standing there. 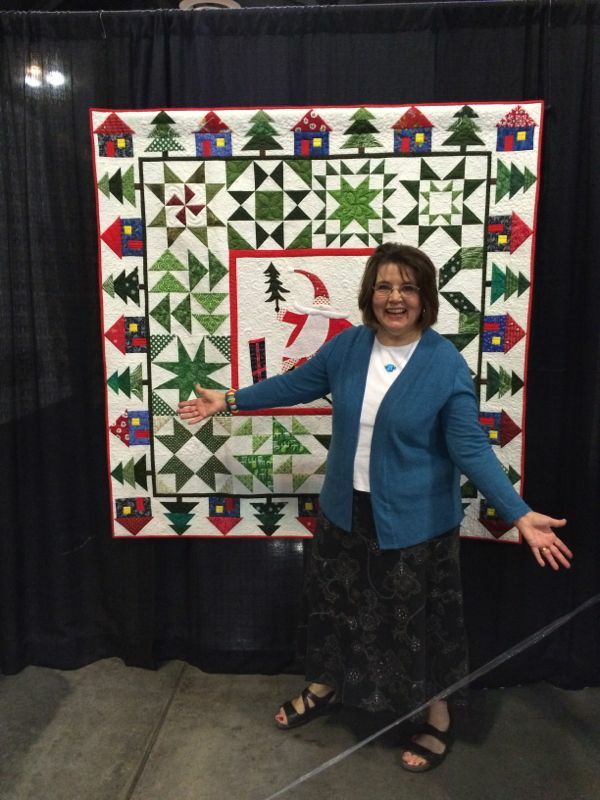 One pair of women had made the St. Nicholas quilt, asked me who my quilter was. “Me!” I said. “Then that’s the difference,” one said. 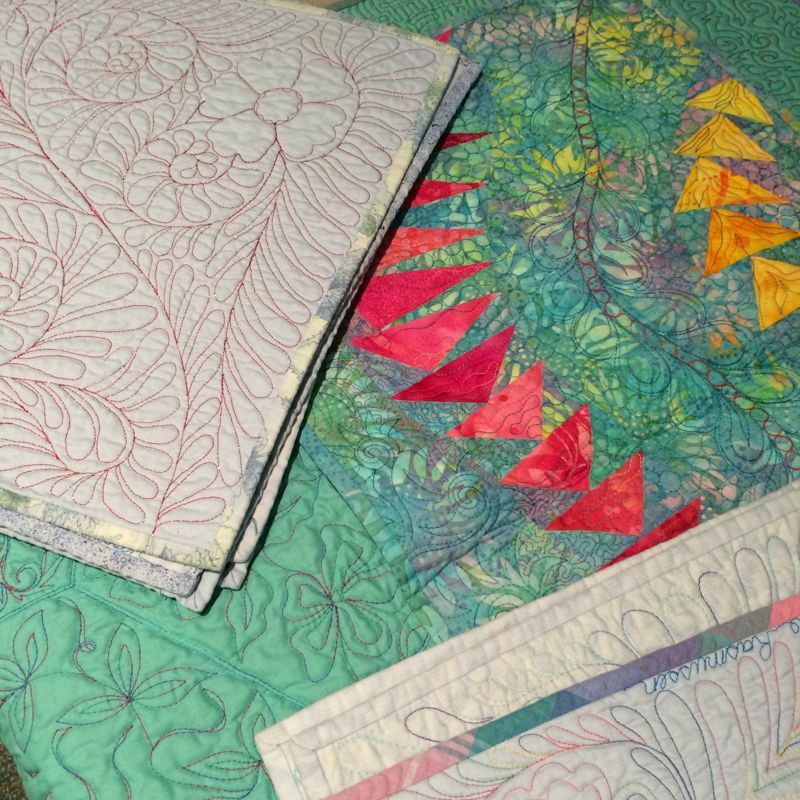 “I sent mine out for an edge-to-edge long arm quilting design and it just doesn’t look as good.” We had a nice conversation about the lovely green and white blocks from all my Mid-Century Modern Bee Mates. 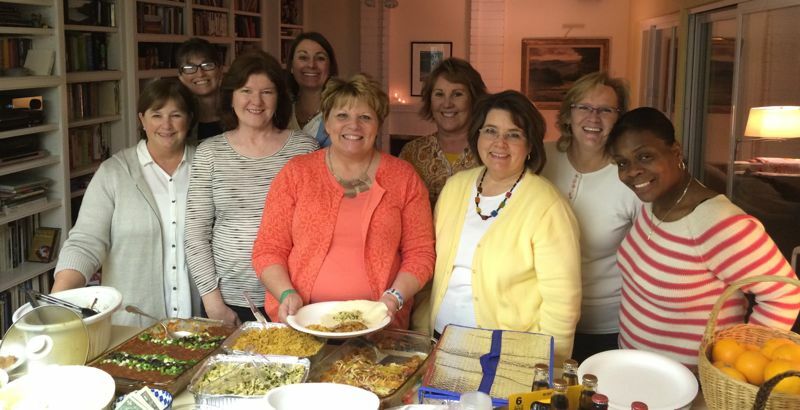 I went Thursday, Friday and Friday night all my local quilting group — the Good Heart Quilters — came to a Road Potluck at my house. After we finished, we sat around the table chatting, trading stories and enjoying each other’s company. 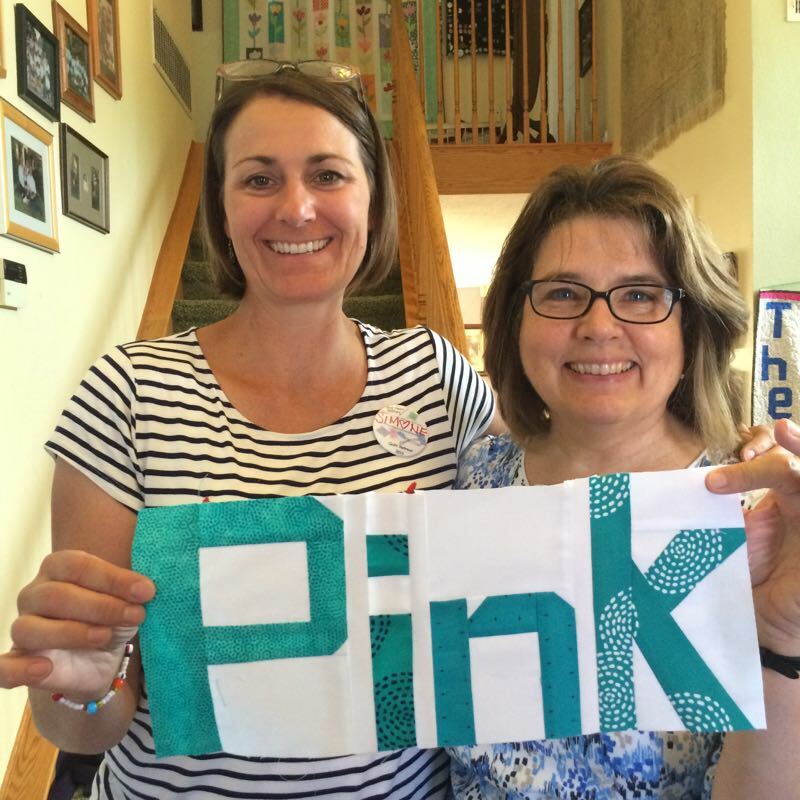 We had some hard news: one of our members starts chemo next month for her newly discovered cancer and I was quite touched by the offers of help that came willingly, to assist her in any way she needed. 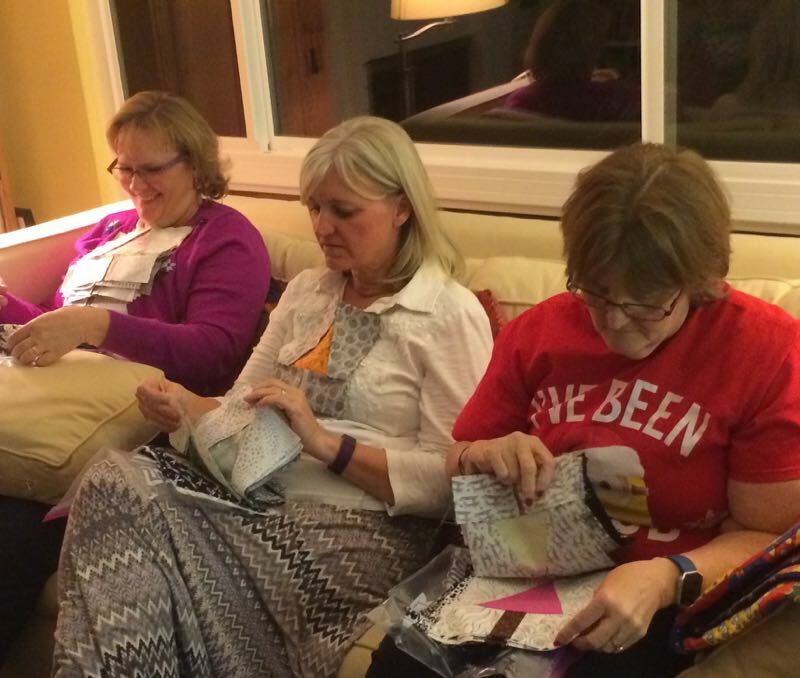 I sat and listened, looked at these beautiful women and felt incredibly grateful to be surrounded by such wonderful quilting friends. They have cheered me on, and celebrated my successes. I can’t imagine my life without them. I’ve put a TON of photos up on Instagram, if you want to click over there on the right on the icon and scroll through them. 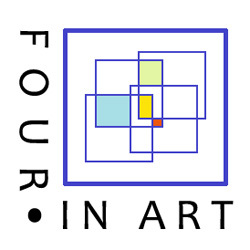 I hope to get some more up in a week or so, but first, I need to address the upcoming Four-in-Art challenge and get that going. The deadline is in about a week! 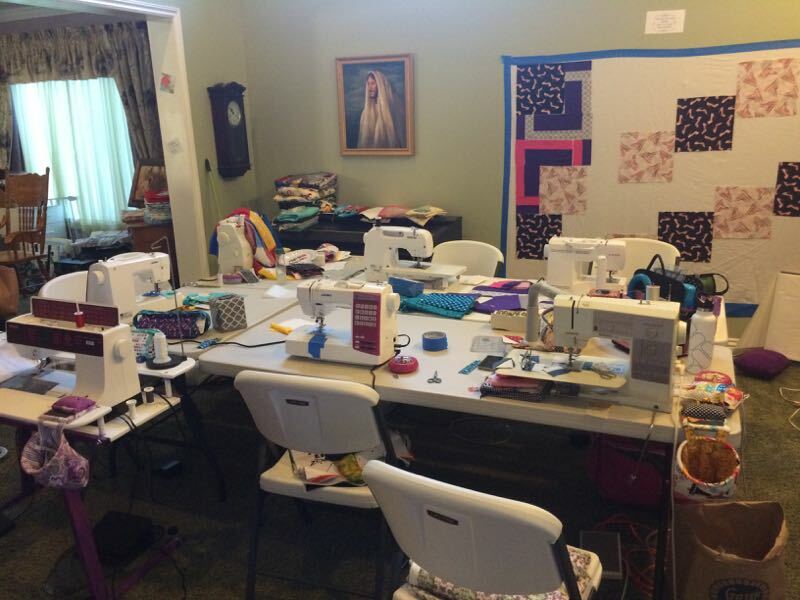 Posted on September 10, 2014 by Elizabeth E.
This past Friday night was our little quilt group’s Quilt Night. We hold it the first Friday night of just about every month, taking off some here and there. 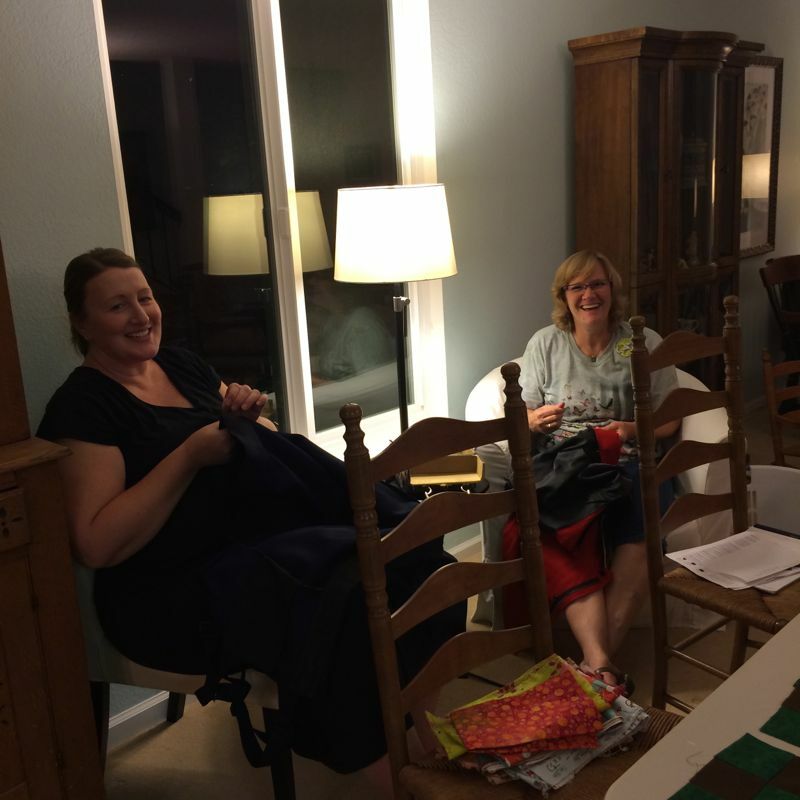 Lisa (on the left) and I founded The Good Heart Quilters when she was pregnant with her daughter, who is will soon be 18. Hard to think we’ve been going that long! On the right is Charlotte, one of our newer members, and Lisa’s running/marathon buddy. 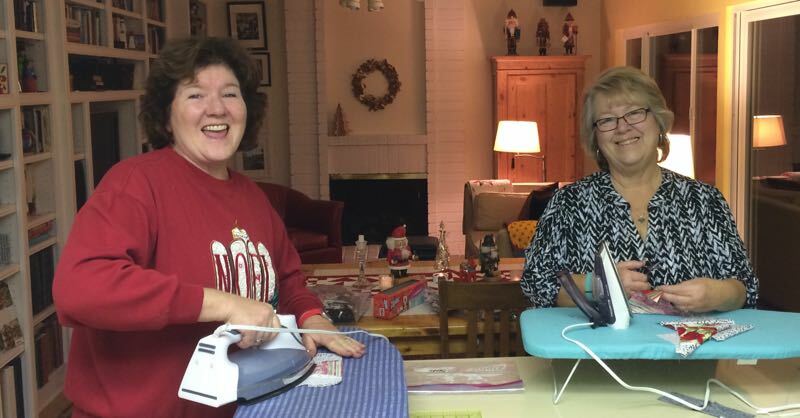 Why are they smiling? I cleaned out my fabric stash this past month and brought all the leftovers for them to claim. Speaking of pregnant ladies, Tiffiny, on the left, is waaaay pregnant and due this week. (So far, no news.) She is our bonafide Newest Member, but I’m guessing with a new baby, we won’t be seeing her for a while. 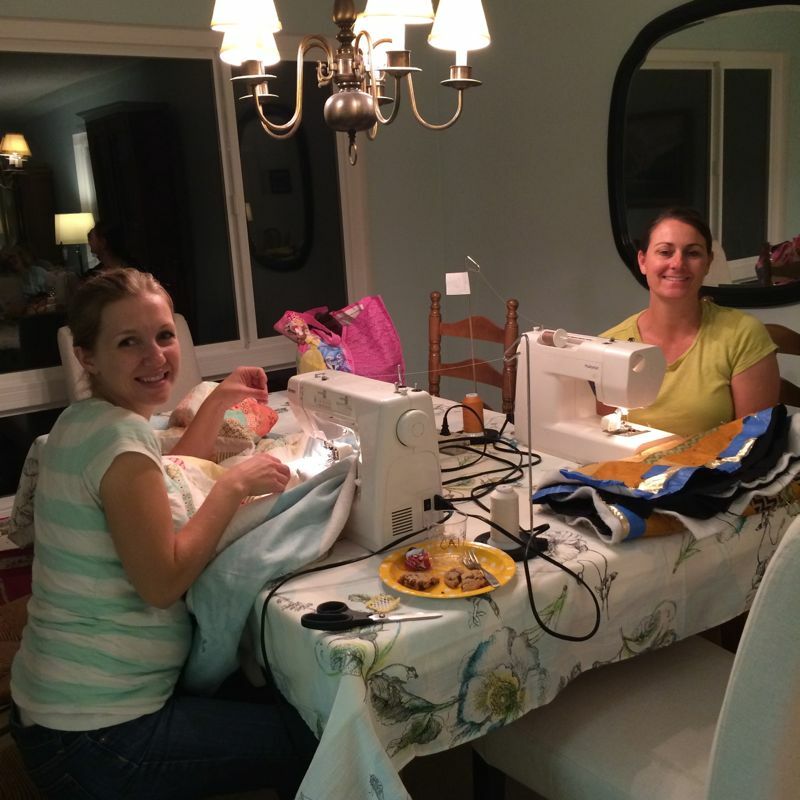 She’s helping Lisa hem and sew buttons on band uniforms (Lisa is a parent volunteer). See? 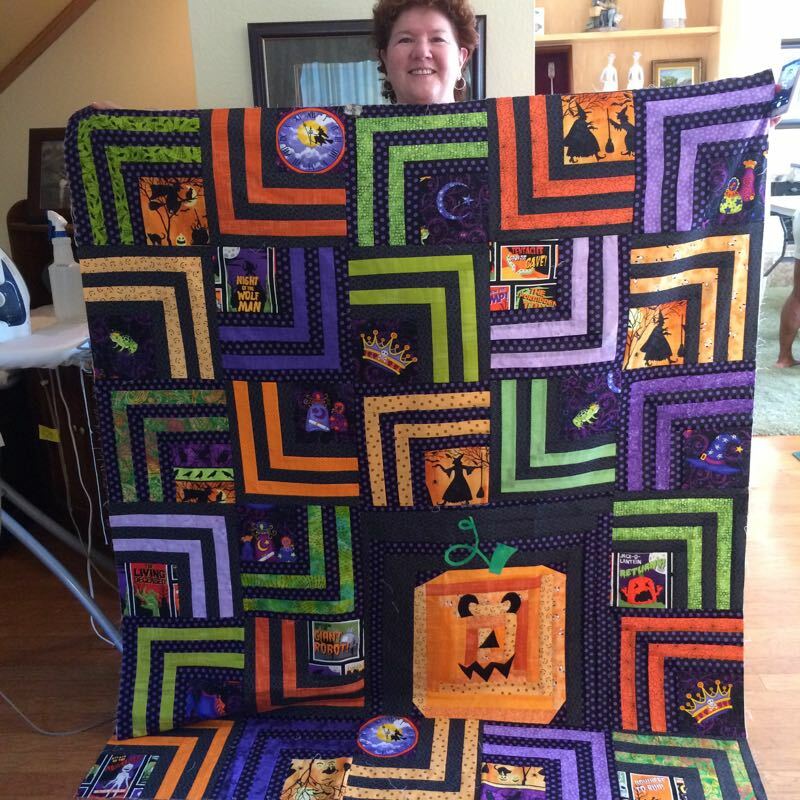 We don’t always do quilts. We want Tiffiny to come any time she wants to as she brought us all a yummy key lime pie. 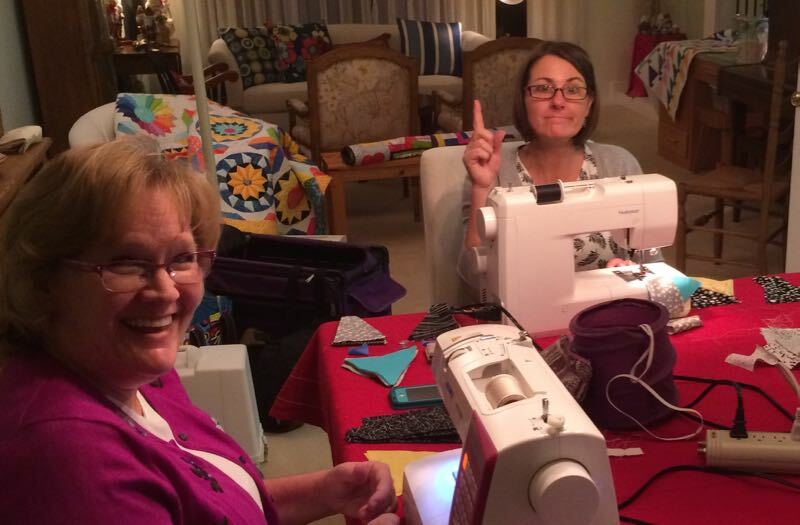 Treats are always a good thing at Quilt Night. And still speaking of pregnant ladies, Caitlin (on the left) is due in January. Simone (on the right) and I rounded out the group and we are definitely NOT pregnant. A small gathering, but fun. And with great treats that everyone brought. 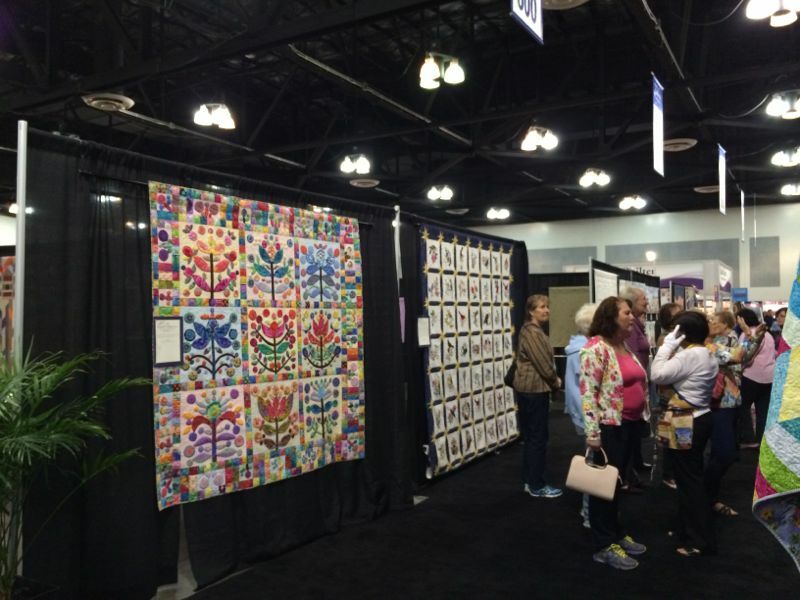 I kicked them all out 10 p.m. because the next day I had to leave at 7 a.m. to head to San Diego to the San Diego Quilt Show, where I was taking a Free Motion Quilting Class with Sue Rasmussen. She was great. 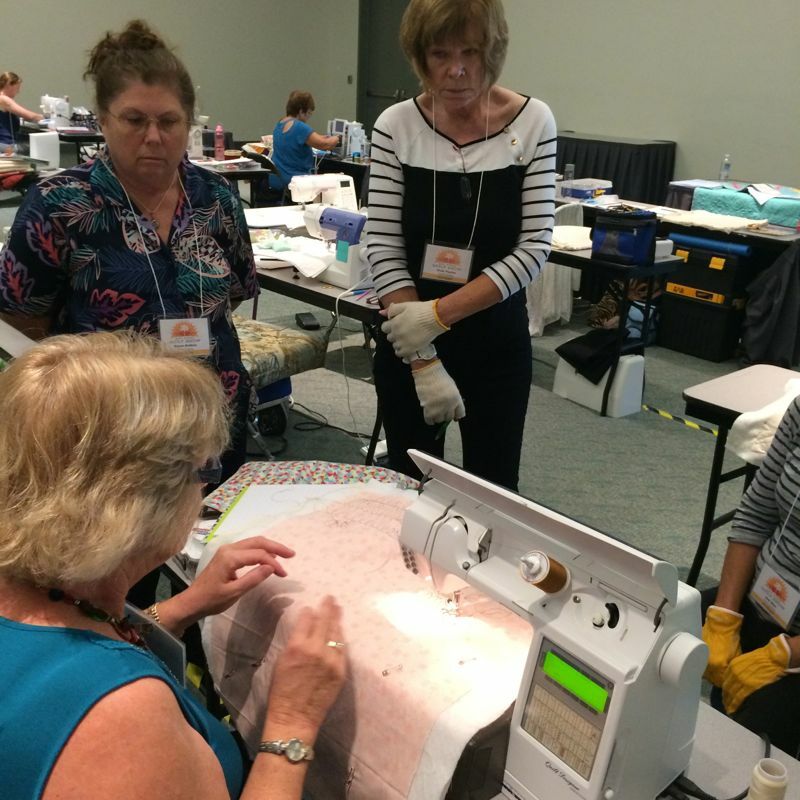 The class started out with a comprehensive overview of needles and threads, but soon we launched into hands on FMQ. 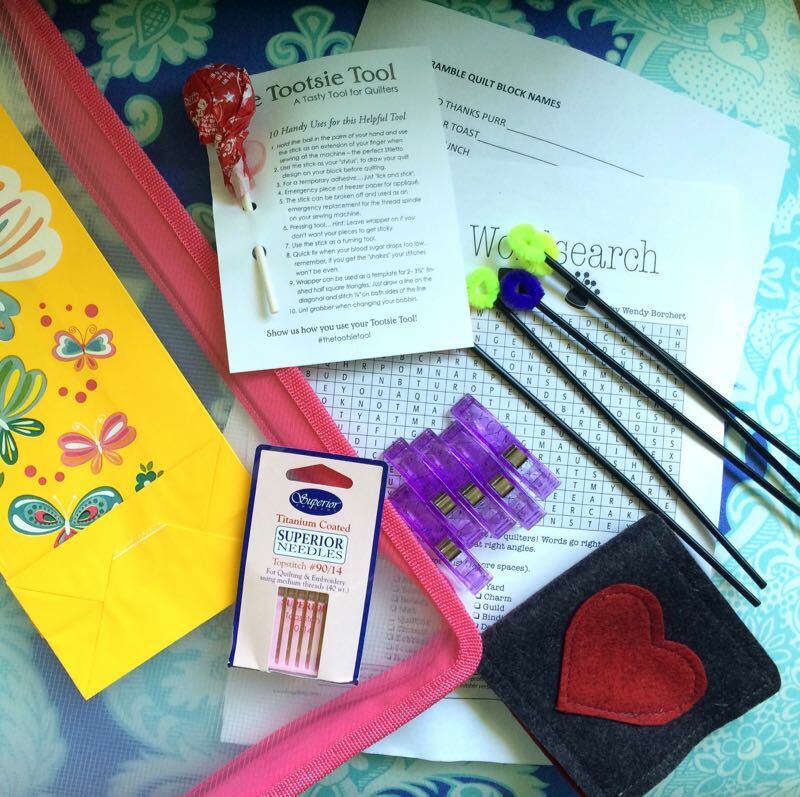 I had taken a class with another instructor about twelve years ago and a lot of what I know now I’ve gleaned through books, internet and Instagram. So I thought it was time to do something classroom-y again. 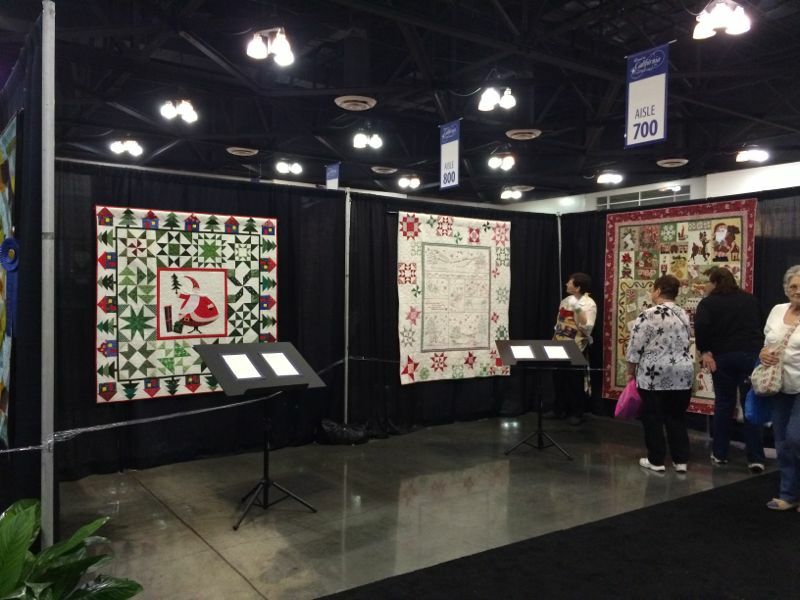 I had an hour for lunch, see the show, and visit the vendors’ booths. 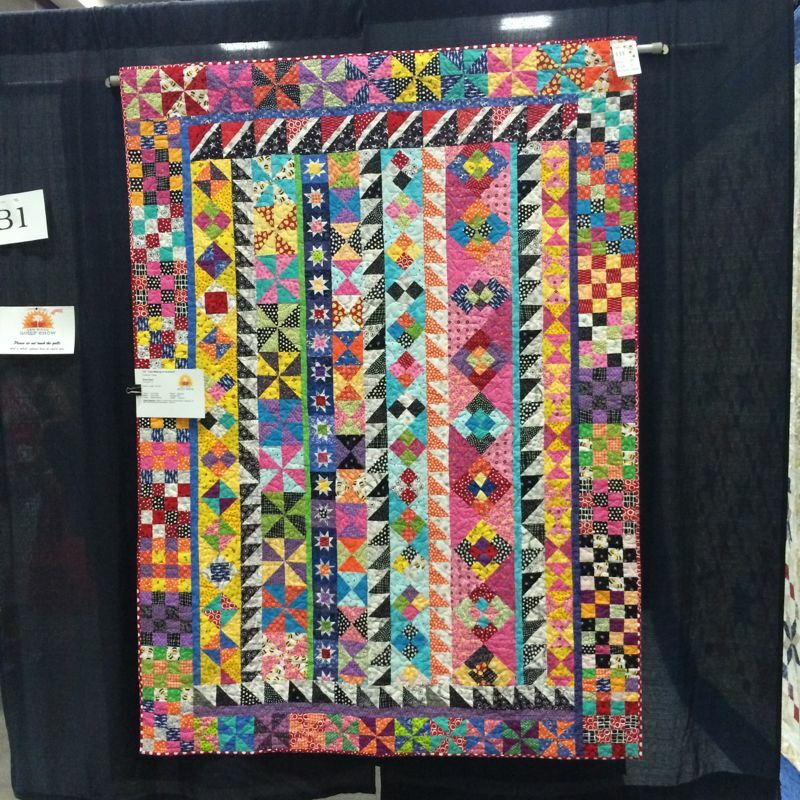 I raced through it, so didn’t have time to grab names or titles of quilts (sorry) but here’s a few photos that I grabbed as we zipped by. 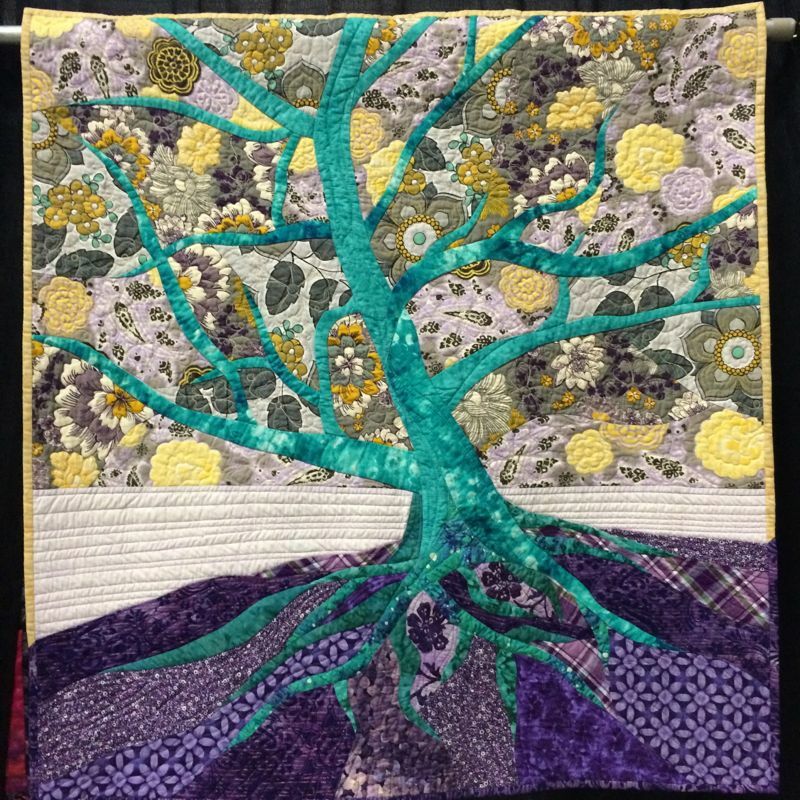 She actually had three of these trees, all in different color ways and different fabrics. 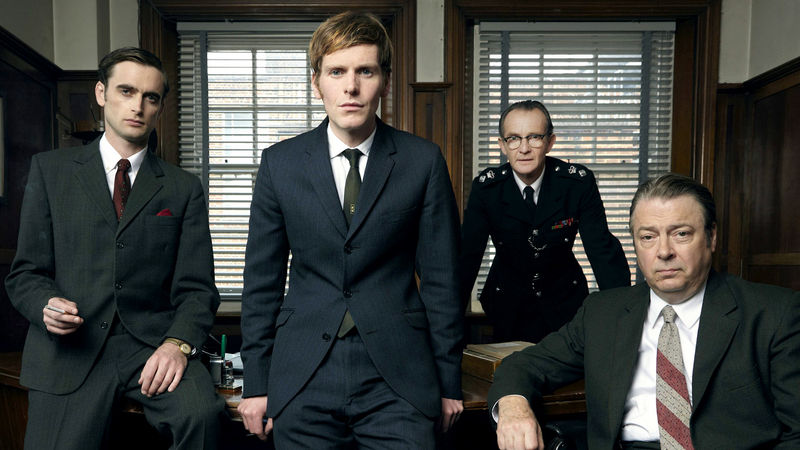 It was fascinating to see how different they all were. Back to class for another few hours. 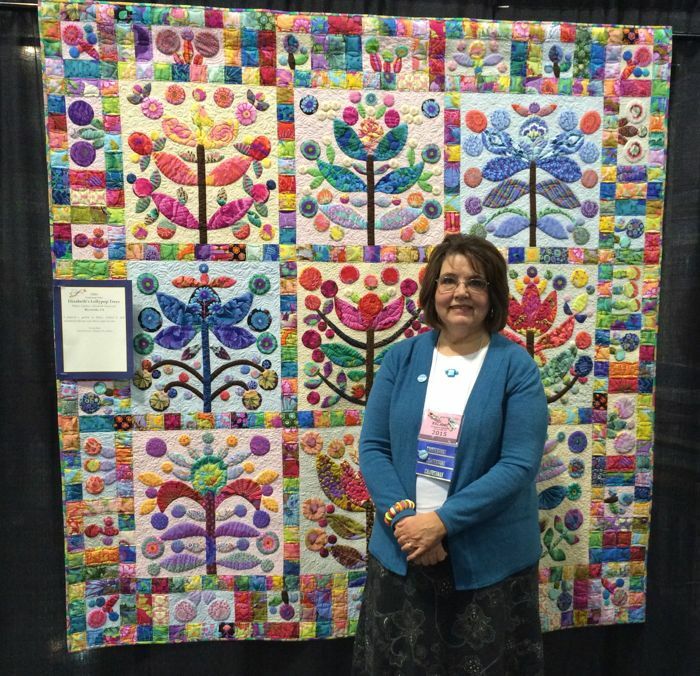 Here are some of Sue’s samples. I really enjoyed her class and was glad I made the effort. 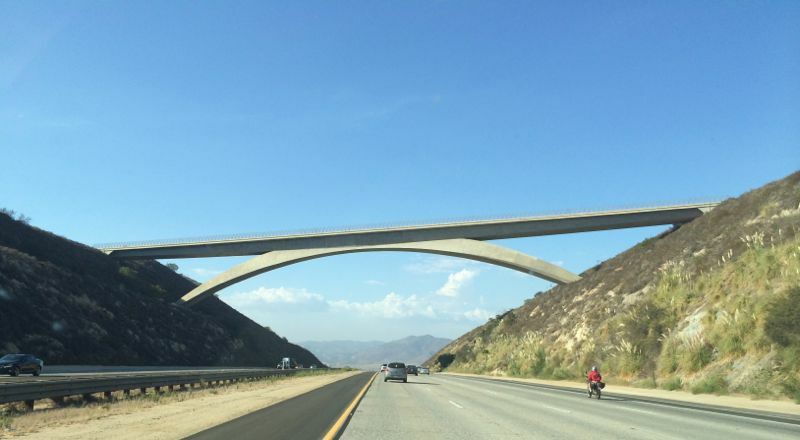 On the long drive home, there is this elegant bridge spanning the wide freeway. When I see this, I know I’m halfway home. It was a good weekend, with good friends and experiences, but heading home is what I like to do most.